If I had a dollar for every 12-hour bus-ride, I probably wouldn’t be over budget at the moment! I exaggerate. But here we were again, this time from Istanbul to Thessaloniki, and this time our drivers liked to smoke on the bus. It wasn’t so bad though and we actually arrived to Thessaloniki two hours earlier than we thought we would. By dusk, we were debating between the hotel with the mental institution-like room or the hotel with the nicer room with breakfast for 10 euros more. After we agreed on the nicer room, and then went out for dinner and noticed the crazy amount of graffiti on EVERYTHING. Fortunately, a few pieces of street art stood out on our walk home. We walked through Galata on our way to meet Josh and Leanne yesterday. 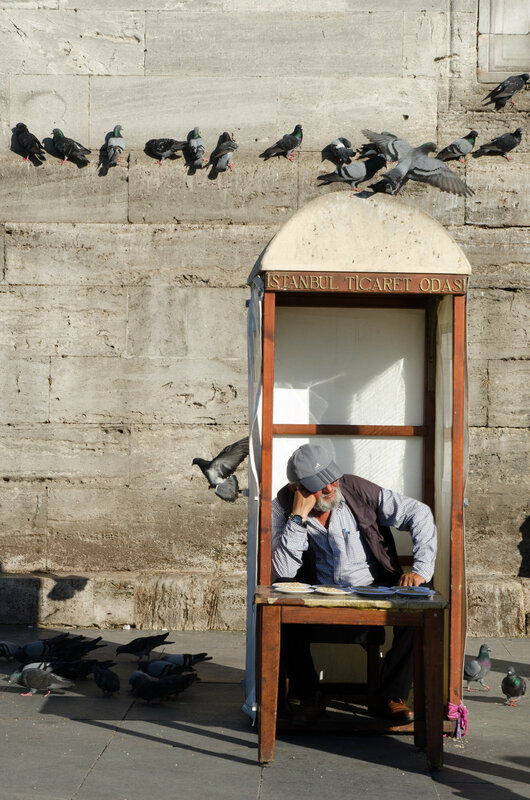 It’s at the very end of Istiklal Street on the opposite end of Taksim Square. We’ve been through Taksim and Istiklal several times, but hadn’t made our way all the way down Galata until yesterday. 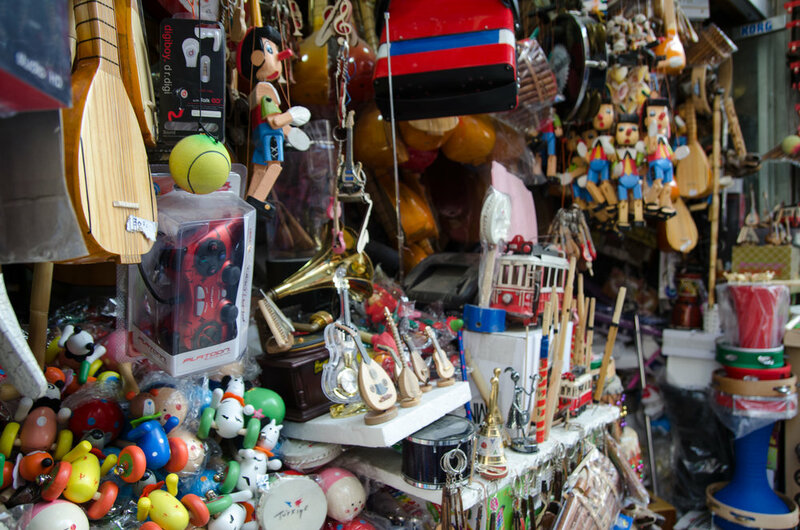 It was calmer than Istiklal (the Myeongdong or Michigan Avenue of Turkey) and much more artistic and eclectic. I knew I had to return for a more comprehensive hang out than a quick walk through to meet our friends. We started our afternoon off with a burger from a little Turkish joint that had pictures promising a better burger than we had seen in a long time. It wasn’t bad! I stopped often to take pictures of the street, of Andrew walking in the middle of it, posters collaged on walls, a random Charlie Chaplin work of art hanging outside what appeared to be a deserted building. Music stores dotted the sides of the street. Andrew declared he just might want a ukulele after a recent Ted Talk he watched. I coerced him into trying one out from a man’s shop overflowing with the most random assortment of… stuff. The old medieval tower, is what the neighborhood is named after: Galata Tower. It’s not so big (only nine stories) and we hear it provides an excellent view from above over Istanbul. I preferred people watching below and ducking in and out of the boutiques that surrounded the tower. 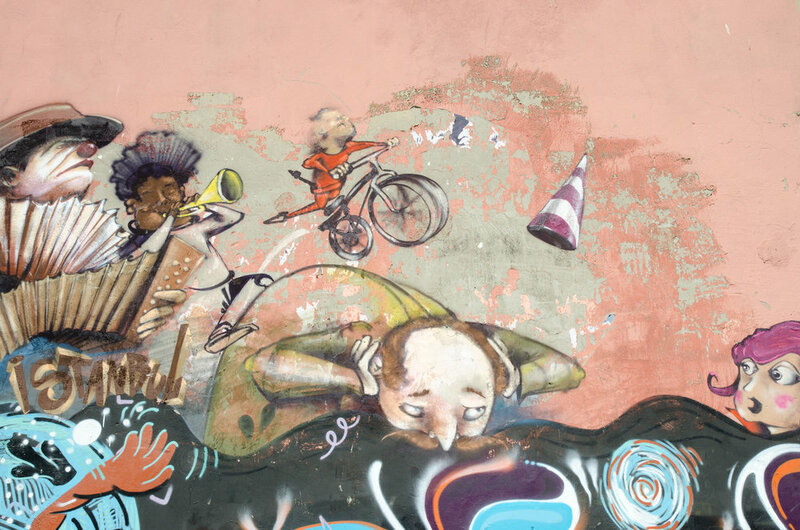 here were some pretty good murals on different buildings around Galata as well, that made me smile. 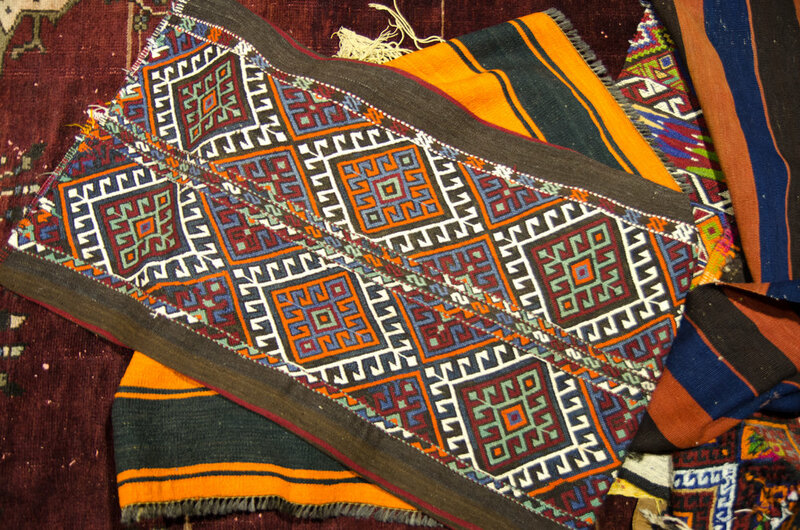 I looked for the perfect carpetbag, and decided to get a close to perfect carpet purse for the time being instead. 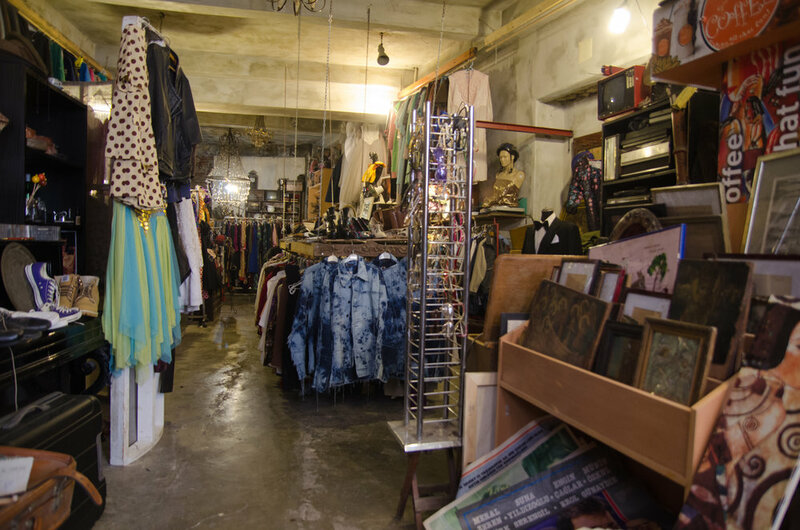 I wandered down an alley and into the most glorious vintage store ever. 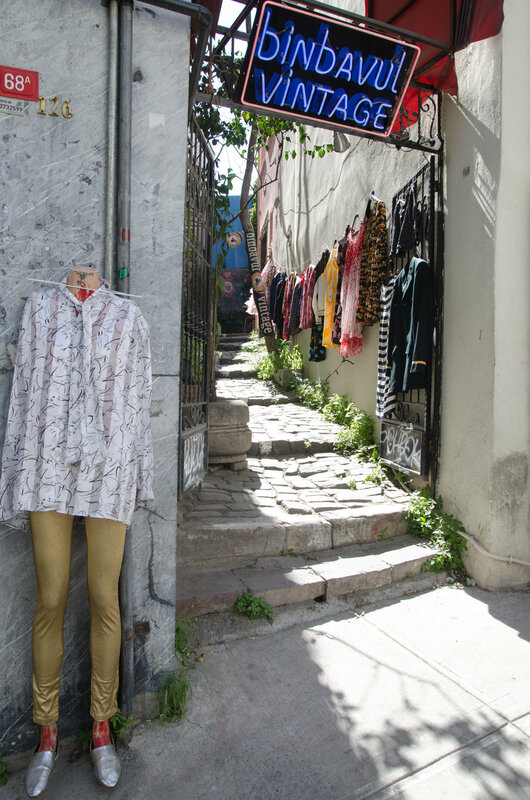 I debated over purchasing a sixties dress while we walked up around Galata some more. We ran into the couple, who stayed at our guesthouse in Selcuk not once, but three times as we walked around the neighborhood. The woman seemed utterly perplexed after asking what we had been doing. I told her we were just walking around, enjoying the street art. 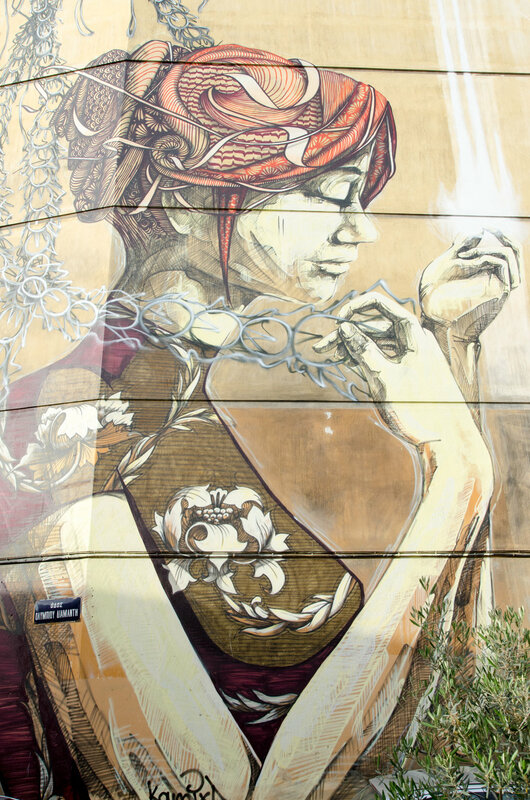 It was like she had never heard of street art, much less wandering around to do just that, wander around. 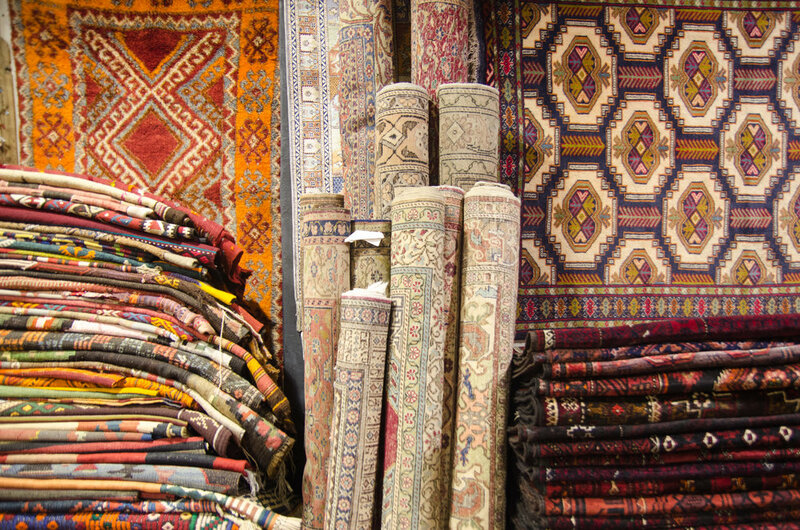 We walked back across the bridge to a carpet shop I had read about online hoping the store, Arsah Carpets carried perfect carpetbags. It didn’t, well, not what I was looking for. But the owner was elated to hear that we had stayed at the guesthouse he had pamphlets sitting on his front counter for. Huseyin was everything the article described him to be, which was a lot of fun! And, as it turned out, he was friends with the guesthouse owner and invited us downstairs to show us some of his carpets. 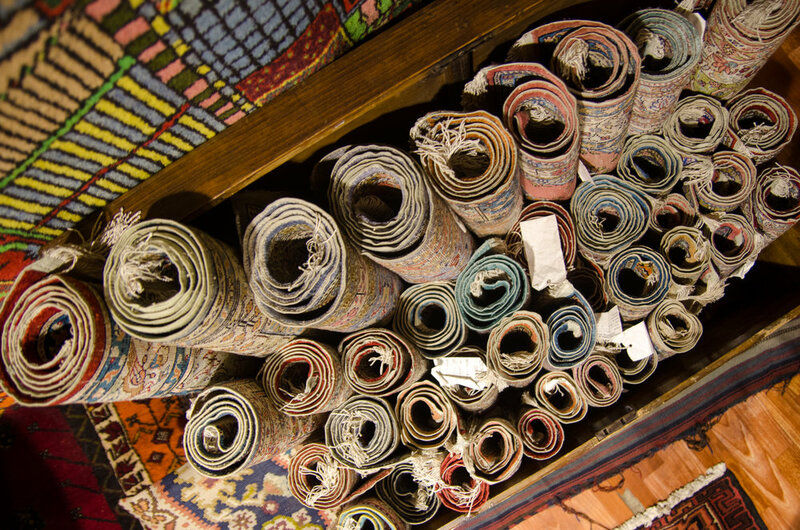 It was fun looking at all of the different carpets, old grain bags, and old saddlebags. 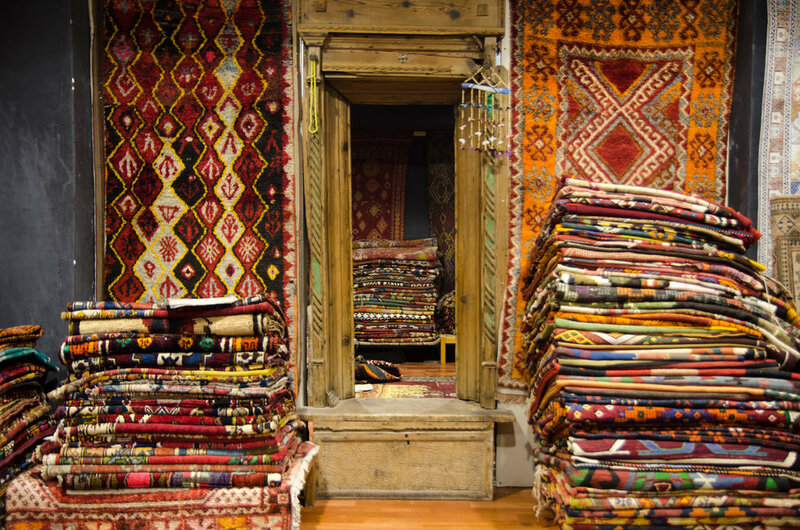 It was also fun that Huseyin seemed to genuinely love carpets and his job of finding carpets around Turkey and selling them to new owners. He wasn’t pushy. He wasn’t aggressive. 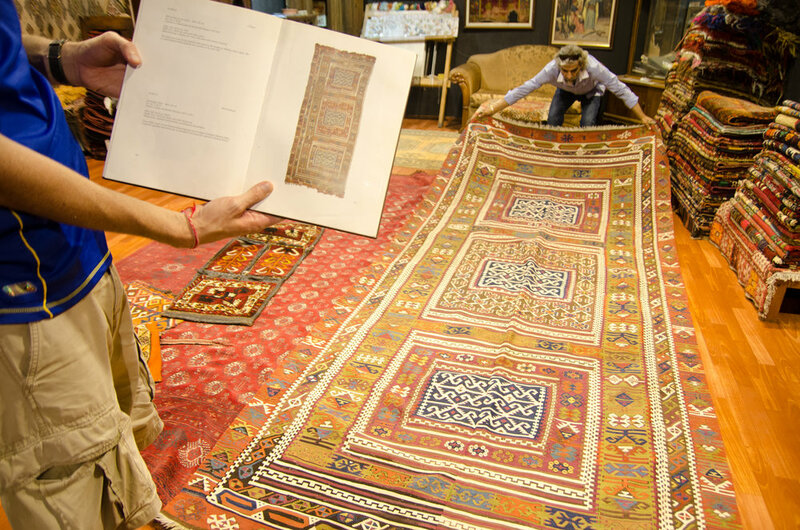 He just let me see what he had and showed us all kinds of carpets (some super old and super expensive) just to show us. I loved this back room Huseyin had going on- it looked like it was just a mirror on the wall, but it was actually a little doorway into another room. He said he designed it to look that way. Good job, sir. I told him I would be back. 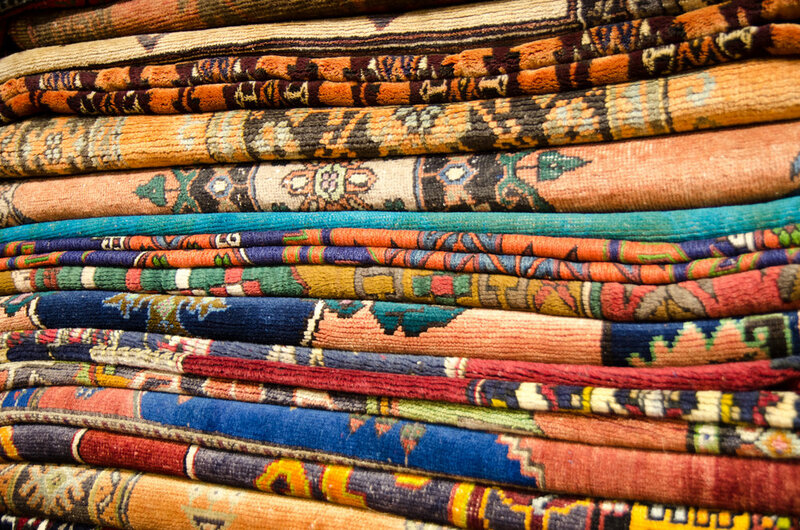 Maybe for a carpet. Maybe for a saddlebag to transform into a tote bag. Maybe for both. But I should probably start setting money aside for where we are going to live when this trip is over, instead of more things to put inside the place we’re going to live. I’ll be back though, that’s for sure! Late to meet up with Josh, Leanne, and Margarita for another evening of nargela, we left to cut across the backstreets of Sultenamet to the old madrassa for our last night in Istanbul. “We’re back in the ‘bul.” as Andrew liked to say. We woke up late, as one should after nearly fourteen hours of travel. We lounged in Juliet and Daniel’s apartment until meeting up with Josh, Leanne, and Margarita for dinner. Meeting up with friends at a subway or tram stop in a foreign city will never, ever get old. It’s one of my favorite things. I’ve met friends in the middle of Prague, at a random subway stop in Tokyo, and a rooftop bar in Chiang Mai – to name a few. It’s one of the perks of being a traveler. Your friends travel and sometimes they happen to be traveling through the same country you are in or they go out of their way to visit or meet up with you on your journey. We met at the Eminou tram stop and headed for a fun dinner under Galata Bridge. “Lady… Listen. Listen… Lady.” the waiter kept trying to interrupt our nonstop catch up to get our order. Leanne and I rolled our eyes. Josh and Andrew ordered beers. Margarita sat enthralled (I’m going to go ahead and pick that adjective, as it’s much more fun than ‘bored’ as she probably was) at us catching up on our past few months of adventures in different countries on our respective trips around the world. Because of Josh’s newfound love of nargila (hookah to you) we all jumped on the tram after dinner and headed to a rather infamous little alley in an old madrassa in Sultanamet for a spot of tea and a few draws off the ole’ pipe. Not that kind of pipe. It’s much less incriminating than it sounds. At this particular institution, and you get the feeling that it is an institution, old men sat playing backgammon or simply taking a break in between work and their walk home. It’s calm despite the hustle of the men who work there serving tea or heating up and delivering coals to their patrons’ pipes. I had a bit of a “Oh, so this is Turkey…” feeling. 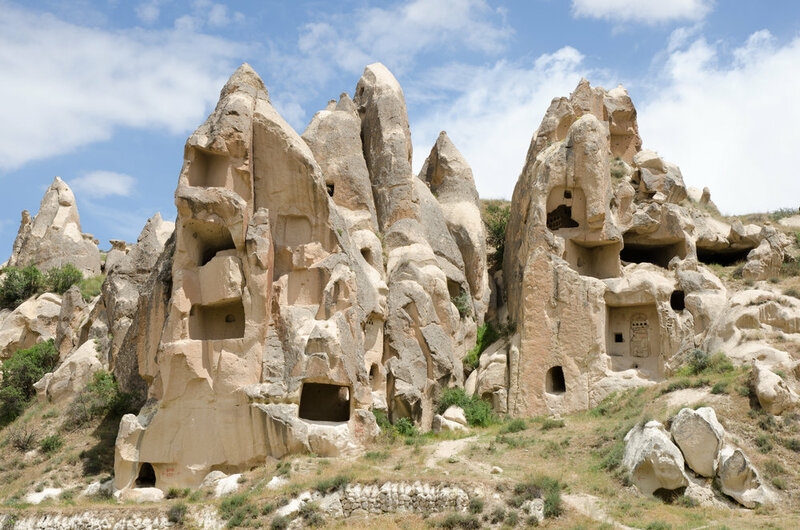 We’ve seen wonderful things here in Turkey (my favorite possibly being Goreme) but it has all felt overly touristy and I was starting to wonder what all of the fuss (over Turkey) has been about. But tonight, I started to get it. 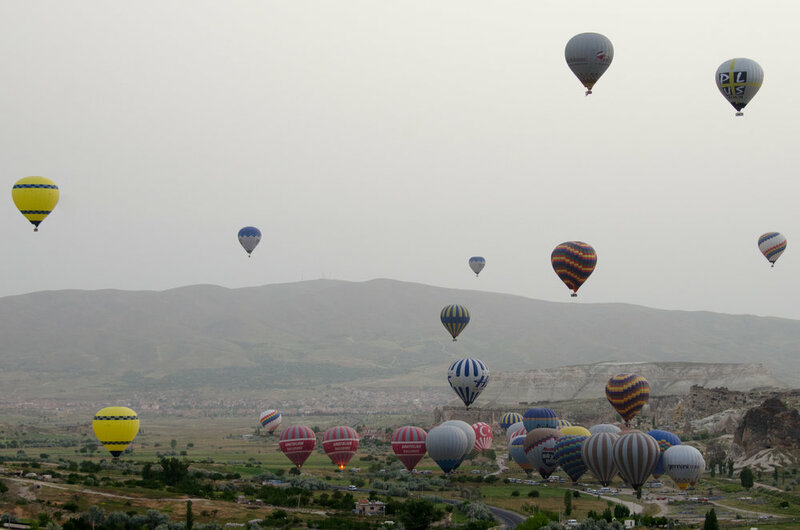 It’s not that I haven’t enjoyed our time in Turkey, it’s just that I expected rainbows and unicorns every day all the time from the way our friends gushed over their visits here. A friend recently asked what I thought about Turkey and I wasn’t as positive as I should have been. The factors of our stay didn’t work in our favor. Turkey IS amazing. I can see how it would have felt more amazing for us if we (mostly Andrew) weren’t stuck wearing the same clothes for a week, maybe if were staying in the heart of Istanbul, and we weren’t on a strict budget (trying to make up for an expensive three months in Africa). Andrew pointed out that it was probably unfair of us to put such high expectations on Turkey. It’s one of those countries I already know I’d like to revisit- with less expectation and perhaps more money. We left our friends earlier than we would have liked to catch the tram/funicular/subway/taxi combination “home.” I was disappointed to have to leave, yet so grateful for Josh, Leanne, and Margarita for showing us a different side of Istanbul that we might not have seen otherwise. 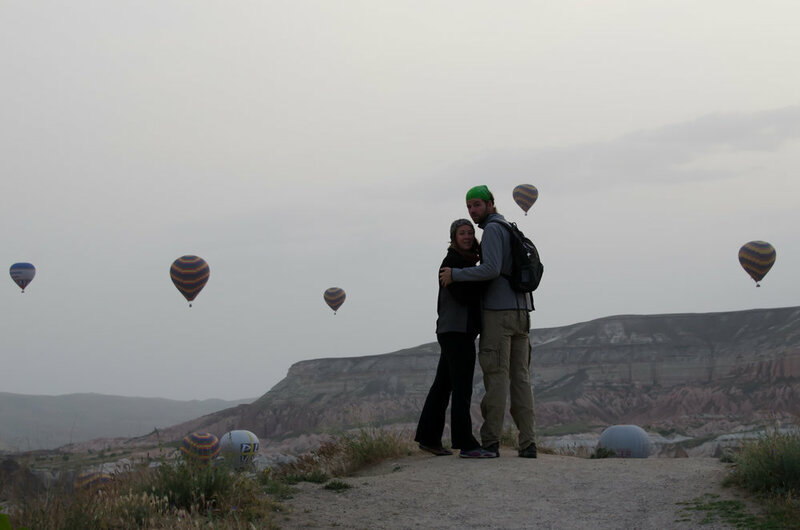 We debated whether or not going to Izmir was worth it… and then we heard from our friends Josh and Leanne (remember them? Our friends from our Tanzanian safari a few months ago) that they had just arrived in Istanbul and would be there for a few days. Meeting up with new friends is just as good as meeting up with old friends. We decided to skip Izmir and headed back to Istanbul to not only stay/visit with our friends, Juliet and Daniel, but to hang out with Josh, Leanne, and their friend Margarita. We are lucky, lucky ducks. Unfortunately, heading back to Istanbul meant another 12-hour bus across the country. It should have been 9 hours, but as we’ve found to be the case in Turkey- the drivers enjoy their breaks, and they enjoy them often. We stopped a lot. Often for 30-40 minutes. We reminded each other we’ve survived worse and focused on the positives: We each had our own seat all to ourselves. Our seats reclined! Multiple stops meant multiple opportunities to go to the bathroom. The bathroom was not on the side of the road in front of fellow passengers. There were even doors and tissue within the stalls! And snacks to be purchased along the way did not consist of burnt birds on a stick. I know you’re jealous of how low my expectations have become. Our bus dropped us off across town from where Juliet and Daniel live. We didn’t get in until nearly midnight. Walking into their apartment felt like walking into my apartment in Seoul after a week or two out of the country. It felt like home, or as close as home has felt since this trip began. “It’s ranked number one according to TripAdvisor.” Andrew said as we waited to be picked up from the bus station in Selcuk a few days ago. Either way, we have been more inclined to slow our roll lately and our plans for the day involved doing absolutely nothing. We lounged. Andrew read. I edited photos. It was awesome. But back to the point about this place: I wondered what all of the fuss was about on TripAdvisor if this place was ranked #1. I had a look and noticed right away that most reviewers had only reviewed a handful of places. This sometimes means someone who owns the place created a TripAdvisor profile and reviewed a few places (including their’s) to boost their own ranking. It’s unfortunate, but usually we (Andrew) can spot the fake reviews. Because Andrew enjoys using TripAdvisor to look up places to stay in advance, I tend to be the one to review them after we’ve stayed. I’ve reviewed well over fifty guesthouses/hotels/hostels/restaurants since our trip started. And because we stay in a different place every few nights, I’ve come to appreciate the little things. Somethings you might laugh at, thinking how crazy would a guesthouse be to not provide a room with walls that went up to the ceiling- but I assure you, it has happened before. They might also be a bit silly to someone who only travels for one or two weeks at a time, like who needs wi-fi when you’re on vacation? -but they’ve become all kinds of important to me! 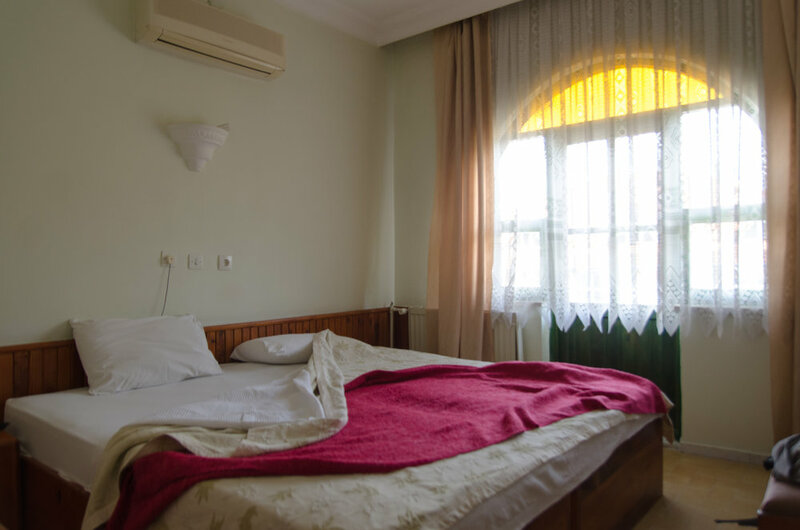 What separates the good and the bad guesthouse is a fine line of knowing what good hospitality is and knowing that the devil is in the details. 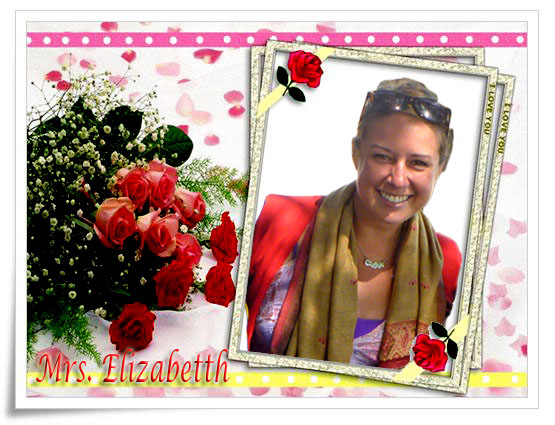 During our walk to Ephesus yesterday, we talked about this and I made notes in my head to share on the blog. 1. a clean, well-lit room with an en-suite clean, well-lit bathroom: One that includes a fan or air-con/heat if needed at no extra charge. One that doesn’t offer a “double” bed by way of pushing two twin beds together. One that has walls that go all the way up to the ceiling. One that has outlets to charge camera batteries, computers, and i-phones. One that has a luggage rack so your backpack isn’t on the floor. One that has lights and possibly a nightstand next to the bed. One that comes with bath towels. One that has hot and cold water. 2. Quiet rooms. Noisy hallways are the worst. I’m not a morning person, and if I’m not staying up late with other people, there’s a reason I’ve gone to my room early! 3. Maid service. Yes, I can make my own bed but I’m staying at a hotel! The beauty of staying at a hotel is that someone else makes your bed for you! 4. If you say you have wi-fi, provide wi-fi. And make sure it works. In all areas. 5. Breakfast included: With Filtered coffee! No instant coffee please! Don’t be stingy: If you serve toast, serve butter. And please let there be a variety. 6. If you have a bar, and you have a happy hour at your bar, then please have reasonably priced drinks. A happy hour limited to overpriced cocktails does not help me when all I want is a beer! 7. 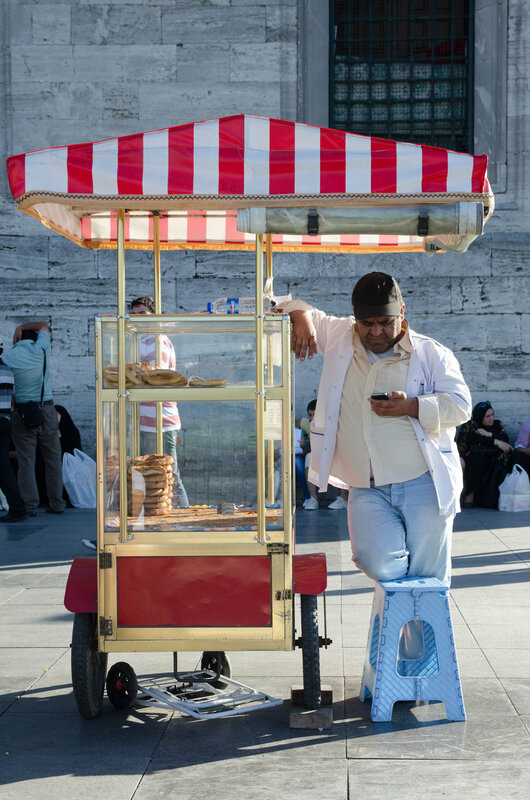 Engage your guests, don’t just push tours on them, or try to sell them overpriced souvenirs. This ‘Getaway’ was nice. Upon first glance it seemed like it would go on the “good” list of guesthouses that we stayed at. But it only satisfied a couple of my requirements in the end and it quickly dropped down to the “meh” list of places we’ve stayed at in the past nine months. I always feel bad giving a poor review on TripAdvisor, but I like to hope that they use my negative review to make a few changes and improve their facility or their customer service for future guests. Before traveling with Andrew, I was more inclined to show up in a city and check a few places out in person. Andrew is a much more prepared traveler than myself and likes to “reward” those with good reviews, hoping it improves service and expectations all around. Our plan today was to do nothing. And then we realized we were out of cash and needed to go into town to get some more. 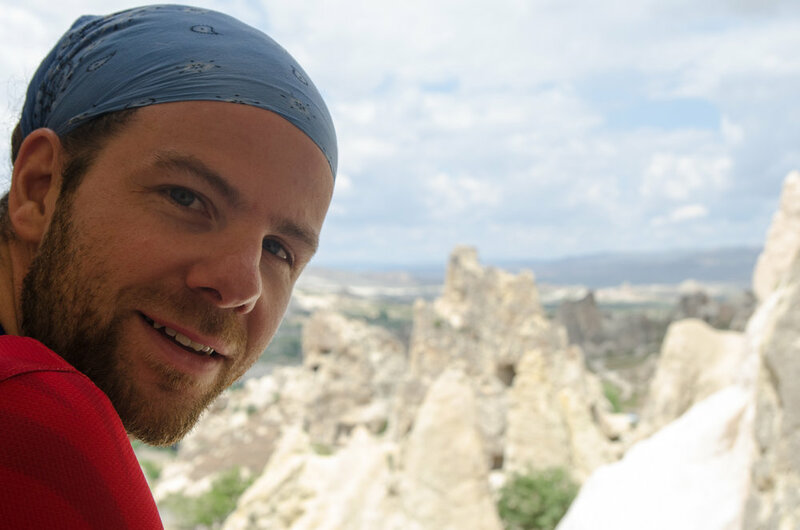 Once there, we decided we may as well jump in a shuttle to the little Greek town, Serince a few kilometers outside of Selcuk. It was the so quiet and calm and quaint that it we agreed it was exactly what we thought all of Turkey would be like. We wandered past the shops and through the little back alleys of the town. We stopped in an old church and sat in the back chatting as other tourists – some in suits – strolled through. There were a lot of birds and we were both wondering and waiting for one of the birds to drop a little gift on the Turkish men in suits. It didn’t happen, but the idea entertained us for awhile. We wandered some more. We chatted some more. Our latest game is asking each other questions a la The Newlywed Game and guessing what we think each other would answer. (We have pretty much exhausted the “What if” and the “Would you rather” questions) I bought some olive oil soap and we called it a day. 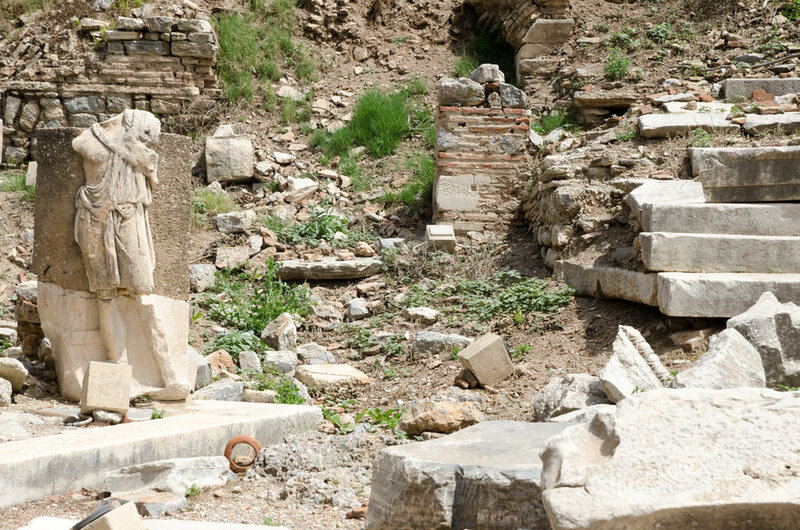 Ephesus was an ancient Greek, then Roman city just outside of Selçuk in Turkey. We climbed a trail behind our guesthouse and then followed the road down to the back gate of the ancient city. It was calm and quiet until we arrived at the gate. 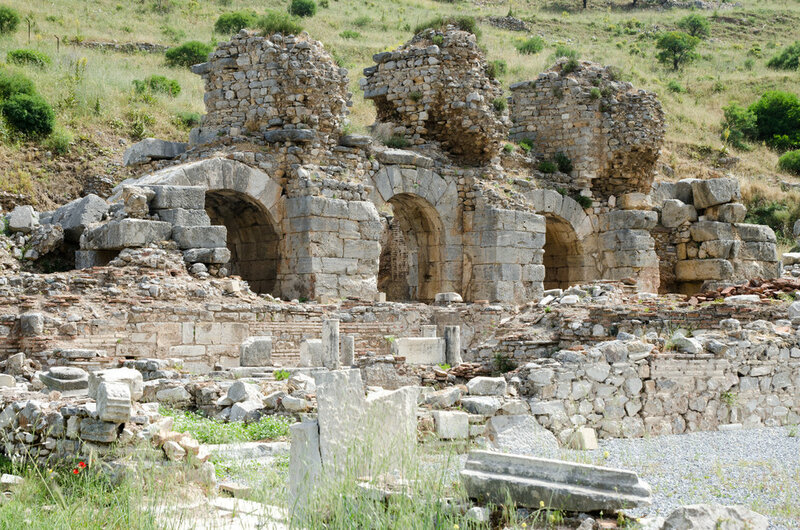 Ephesus was packed. We were warned that cruise ships unloaded at nine, but it seemed that regular bus tours unloaded around ten thirty, when we arrived. We tried to wait out the groups, sitting in the theater, people watching. But it didn’t seem to matter, groups and groups of people continued to stream in, so we eventually got up and made our way through the surprisingly big city! A woman at our guesthouse encountered a snake along the trail the day before, I think Andrew was relieved we only encountered a little turtle instead. This is where we sat for awhile. If it wasn’t so sunny and hot, we probably would have stayed longer. I love sitting and soaking up my surroundings and if there are many, I try to embrace the tourists around. 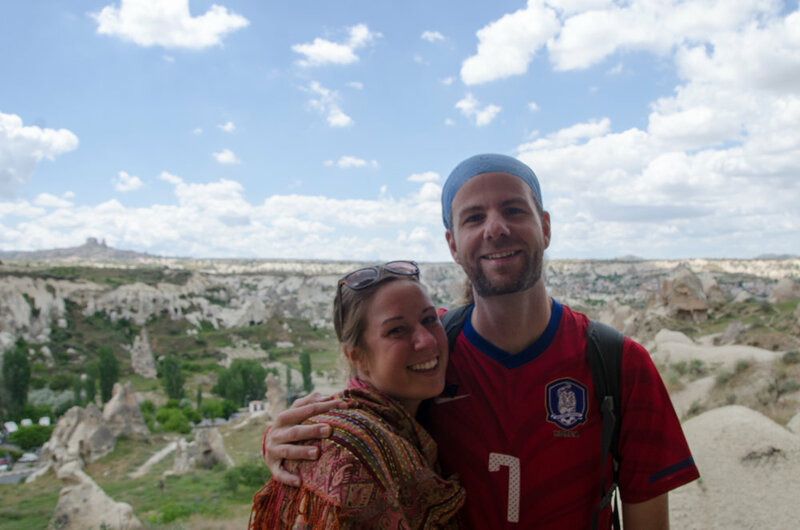 There were a LOT of Americans and because we’ve encountered so few Americans on this trip, I wondered if this was their first time abroad (for some) and why Turkey (for others). I marveled at how easy Americans are to identify. We are a loud people. We tend to have a presence of making ourselves seen rather than allowing ourselves to see. We wear shorts. We wear flip flops. I don’t know if any of this makes any sense, but these are things you pick up on about “your people” in my case, my fellow Americans when you’ve been outside of America for so long. Despite the heat and the throngs of tourists (still something we are adjusting to after being in countries with sparse tourism and/or few visitors) it was incredibly interesting to walk through. And as always, made me wonder what life must have been like when the city was in its heyday. For me, it’s the ancient times that seem so glamorous especially when the grandeur of the city is so immense like it was in Ephesus. The most impressive part of the city was without a doubt, the library. I overheard a tour guide say that it has been rebuilt, but it seems to have been rebuilt rather well – without the use of obvious concrete like we saw in a few other parts of the ancient city. 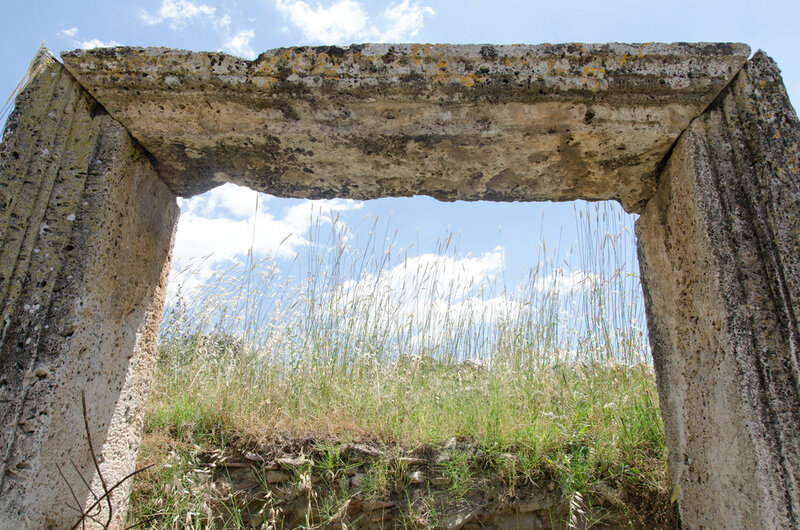 Even when we walked out, it was through more ruins that you simply couldn’t believe were still standing and added to the size of the ancient city. 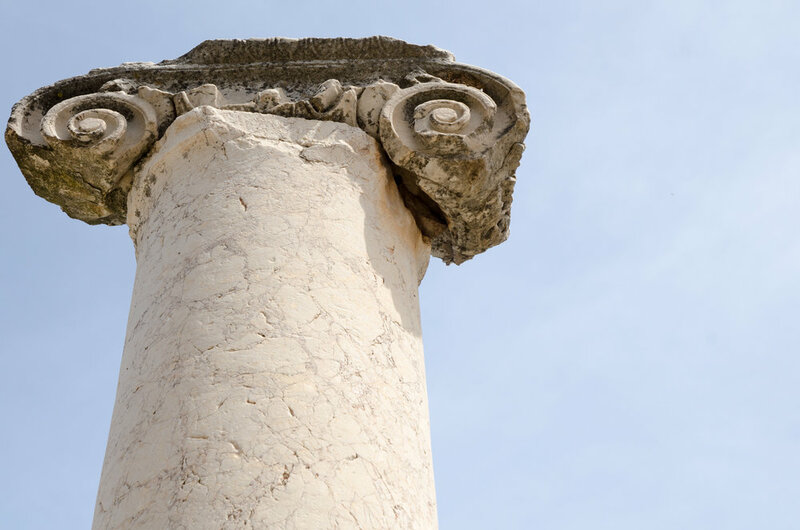 The ancient city also held the Temple of Artemis (one of the Seven Wonders of the Ancient World). This wasn’t within the current day grounds of Ephesus and we had to walk a few kilometers back towards Selcuk to see the singular remaining column of the ancient wonder. It was one of those “Wonder of the Ancient World… Check” moments and then we weaved our way back out to the road, dodging tour buses until we were back on the highway deciding to walk back to our guesthouse. Our guesthouse was two kilometers outside of the city. 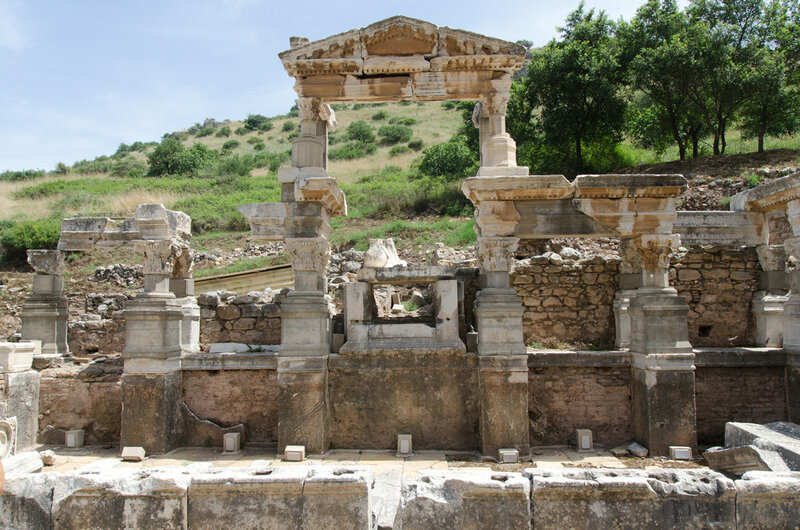 We had already walked to Ephesus, then to Artemis… Walking all the way back to our guesthouse probably wasn’t the best idea, but we made it and then collapsed, yet again outside of the pool until dinnertime. 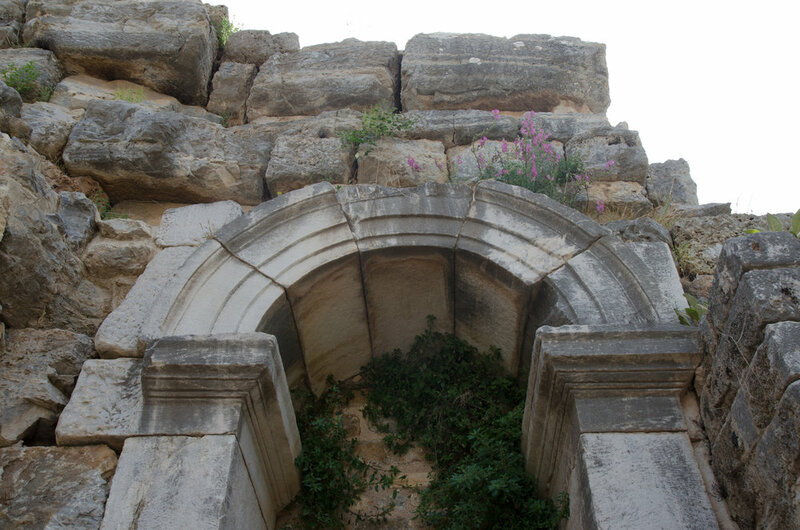 According to Wikipedia, the large necropolis (burial site) includes the Sarcophagus of Marcus Aurelius Ammianos, something we didn’t know when we walked through. Maybe we would have learned of this in the museum, but it was Monday, and alas, that meant the museum was closed. 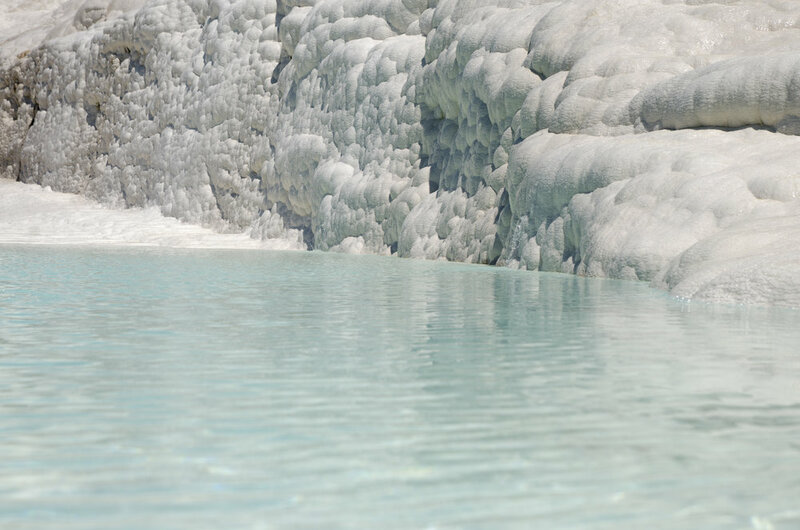 Maybe you’ve seen pictures of the Pamukkale travertines, the beautiful aqua blue water against the white mineral deposits that used to be something of the face of tourism in Turkey. I did, and being in Turkey, wanted to see them. It’s a bit of an illusion at first when you take off your shoes to walk up the sparkling white slope to the pool. You expect it to be slippery or cold even, but it’s neither. 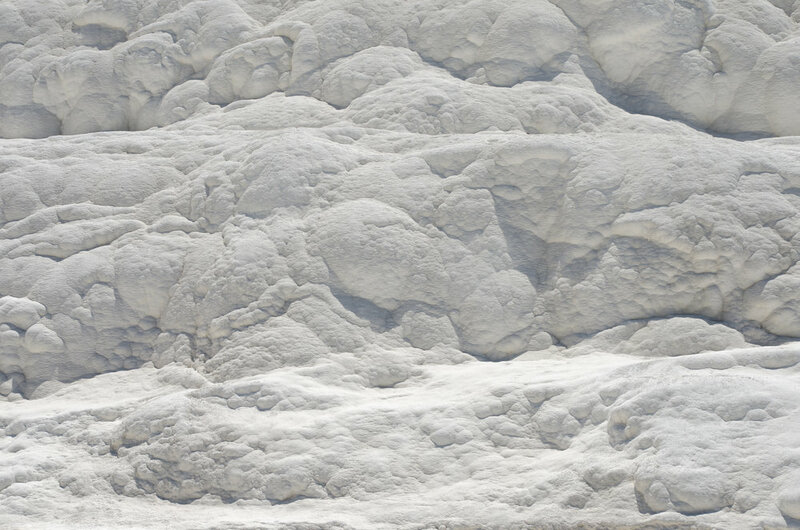 It’s rough (almost like walking on pumice stone and in some places it’s cool due to water or shade, yet in others it’s warm due to the sun sparkling over its surface or warmer spring water running over it. It’s breathtaking walking up and nothing like I’ve ever done before. 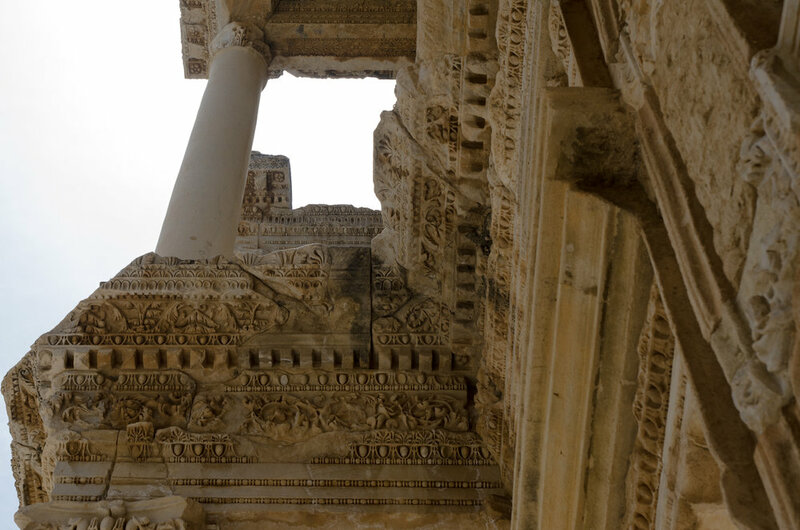 And then, as you near the top and it’s more crowded thanks to the tour buses who have deposited their groups in between Hierapolis and the travertines for their convenience. Women and men of all shapes and sizes perfect their modeling portfolios against the glistening white background. 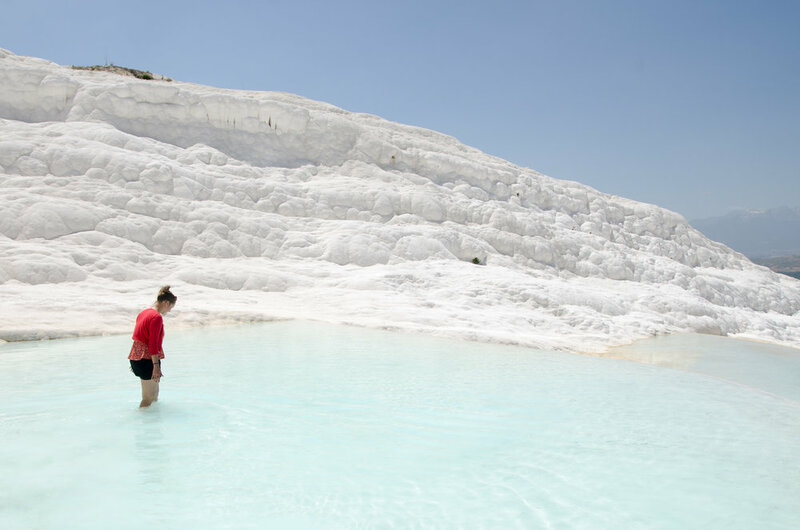 Everyone gets into the pools, standing or submerging themselves in the spring water, some smothering the chalky mineral deposits on their bodies for fun or with expectations that it will improve their health. Children have a field day. It’s equally fun participating as it is watching everyone else enjoy the natural wonder. 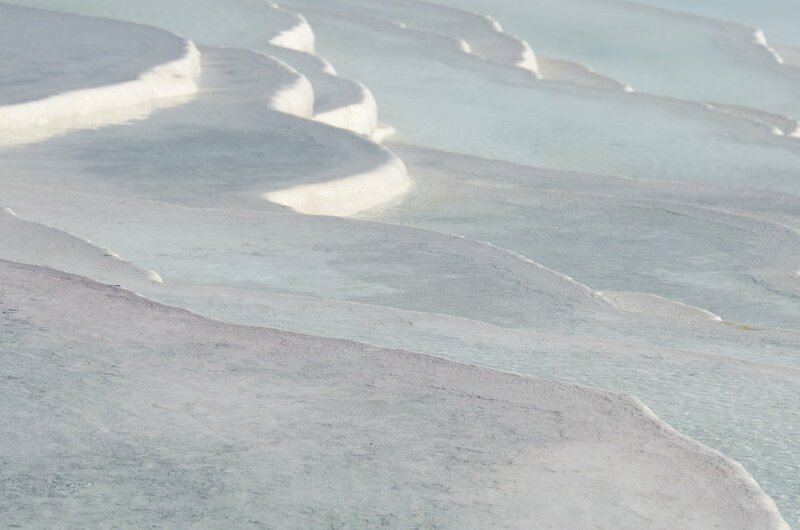 Once you are at the top, you can see more clearly the dried up travertines. 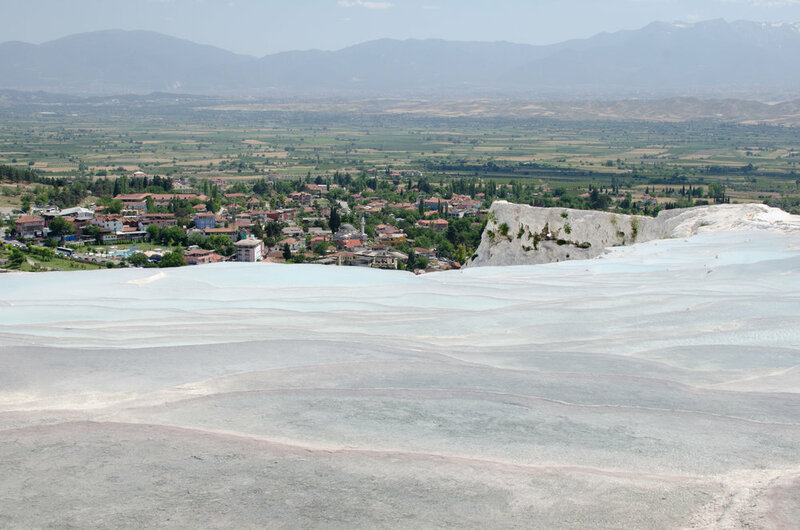 Apparently, Pamukkale used to be a thriving town and tourism destination, until the government intervened. This is where it becomes unclear (at least to me). 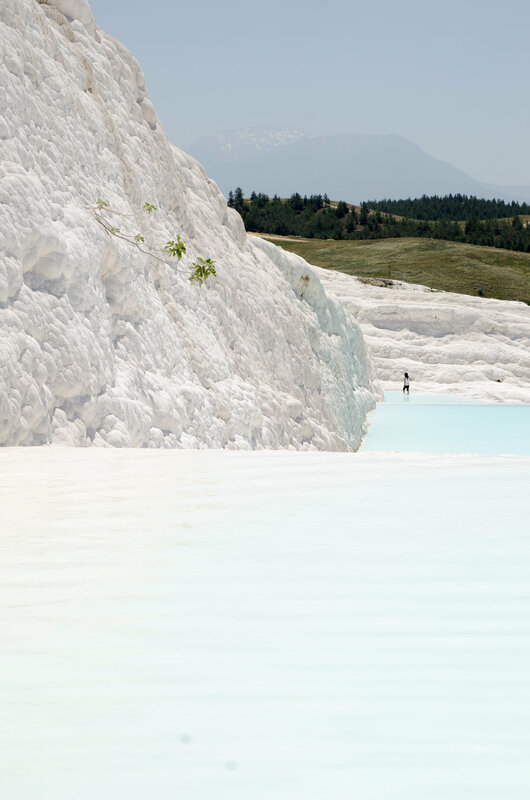 After Pamukkale was declared a World Heritage Site in 1988, the government removed the road leading up to the natural springs and built artificial pools for tourists to get into. Shoes were prohibited (and still are today) when walking on the slope. That part is easy to digest. 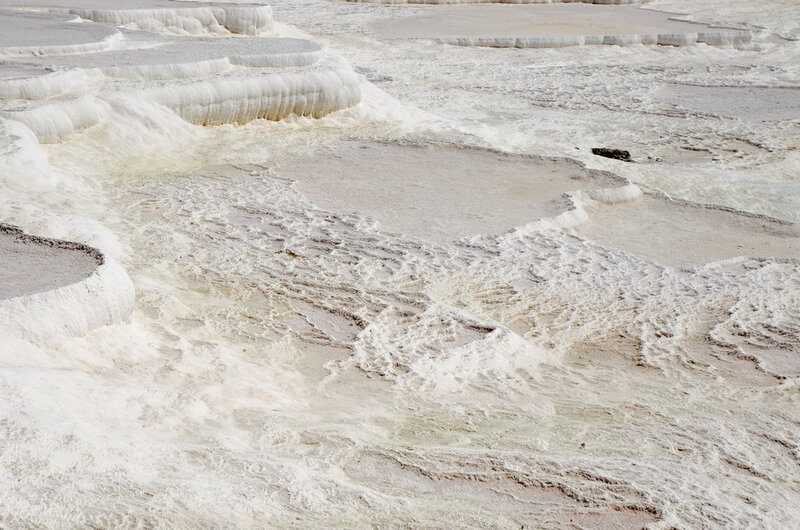 What is not easy to digest is how nearly all of the natural pools of water have dried up. Completely. 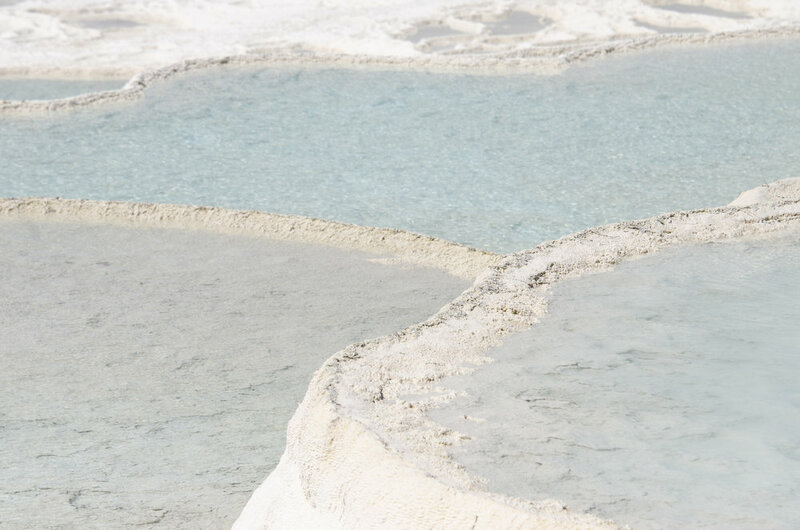 I couldn’t help but think of the terraced rice paddies in Vietnam when I was photographing these terraced hot springs. I also could not stop photographing them either- obviously. Just scroll through if they don’t mesmerize you the same way they did me. Hopefully, and I’m sure, at least I want to be sure that the government knows what they are doing and this is all just temporary. Maybe in a few years the springs will be back in all their glory and I can visit and recount the days when the springs were all dried up. 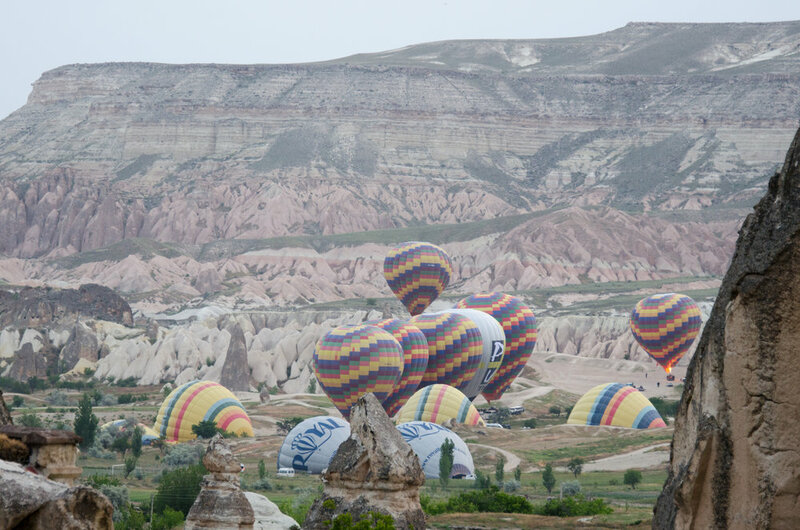 We were going to get up our first morning for the rising of the hot air balloons over Goreme, and then we didn’t. We tried our second morning, and again, it didn’t happen. Our last morning it finally happened. 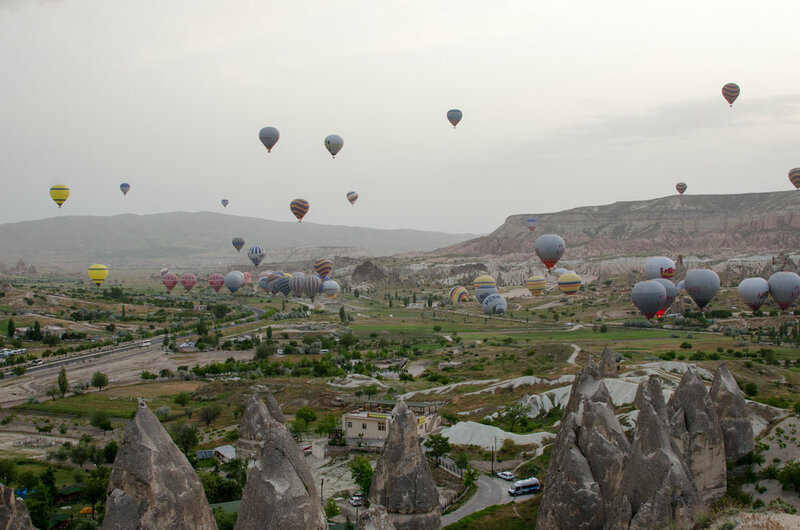 We had planned on being out of our guesthouse by five in the morning, made it out by five thirty and still had time to spare before many of the balloons were inflated and rising into the air. Surprisingly we were two of only a handful of people up and on top of the ridge overlooking the town that early. It was quiet and peaceful and a magical way to start the day. It was really quite mesmerizing. Watching so many balloons inflate and rise up into the sky. We counted up to ninety, but we’re positive we missed some so we’ll just round it up to there being at least one hundred in the sky. 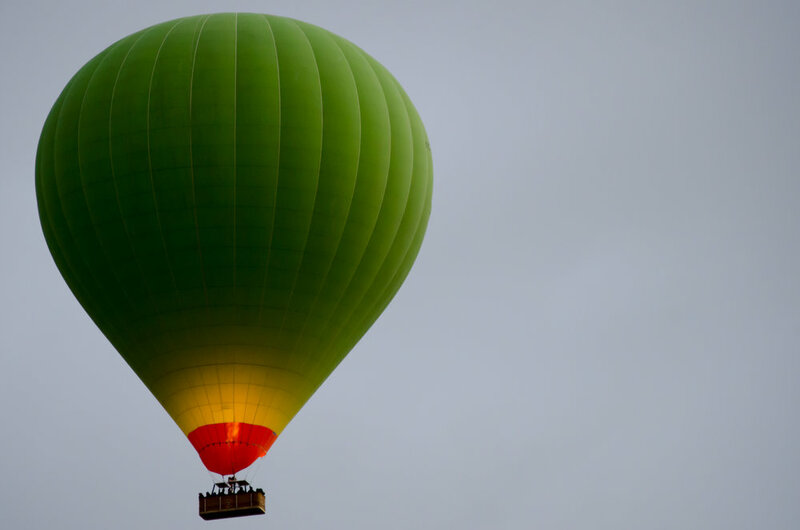 A few facts about the balloon rides (and why we didn’t partake in one): Each balloon can carry up to about twenty people. The ride is less than two hours. The starting price for some companies is 200 euros. Not even dollars. euros. Needless to say, I was totally content watching from below instead. A few hours later, we were walking around Konya, a town famous known for being the birthplace of the infamous whirling dervishes. 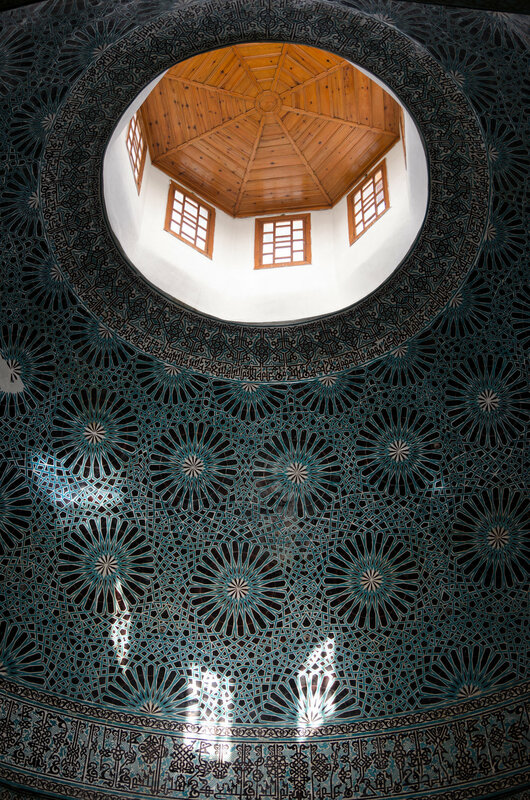 There isn’t much to do in the town aside from a few architectural sites and a weekly dervish ceremony. The town isn’t exactly on the tourist route, and it’s known to be on the conservative side. We decided to swing through to break up our trip back towards the coast. We were going to spend the night, but then we saw how much hotel rooms cost and changed our minds. Instead, we arrived in town early in the afternoon and bought tickets for the midnight bus to Pamukkale. We stashed our backpacks in a locker and headed into town. Obviously, we’re not Turkish, but we haven’t felt like we’ve stood out in Turkey the way we stood out in the middle of Laos or Uganda. Suddenly though, we felt like we were getting stares. Not reproachful stares, but lingering looks nonetheless. I had pants on, and a scarf around my neck, no exposed shoulders, and I was even wearing proper shoes. It wasn’t me. “I think it’s your shorts. And maybe your flip-flops.” I whispered to Andrew, as we walked through a park where everyone seemed to take interest in our passing through. No man was wearing shorts. And in the entire day that we were there, I saw only one other person have sandals on. 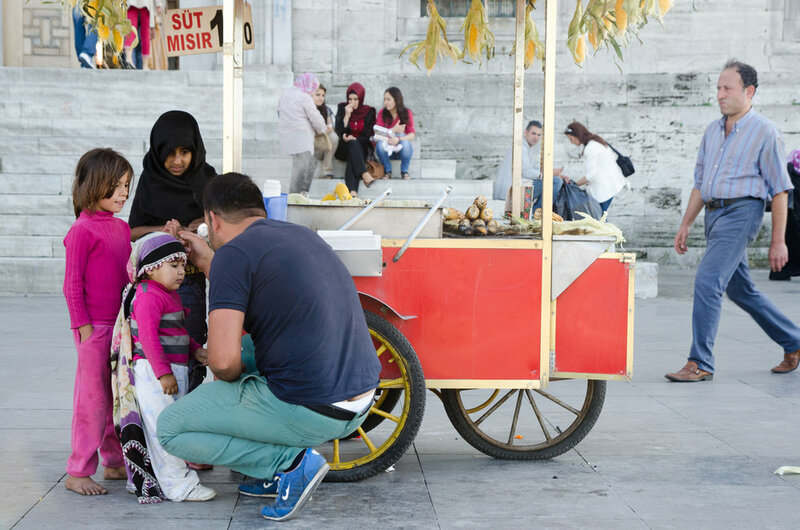 The attention was strange, and got curiously entertaining as we stood outside the Ïnceminare Medresesi eating ice-cream. It’s one of the three things to do in town. 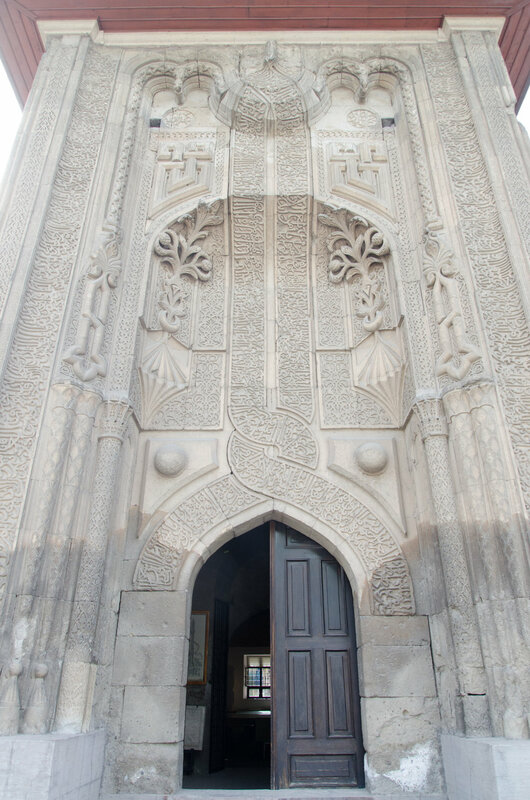 Mostly for the intricately carved door. We didn’t bother going inside the museum, instead sitting out front eating ice cream and watching everyone enjoy their Saturday afternoon. And then… a group of girls approached us. They asked our names, where we were from (in very little and broken English) and then if they could take a picture with us. We laughed a bit, but agreed. There was a group picture, and then each one took turns posing with us. This was somewhat interrupted when two older boys came up, and asked if they, too, could take their picture with us. One was from Senegal and the other Ghana. They were in Konya studying for six months. 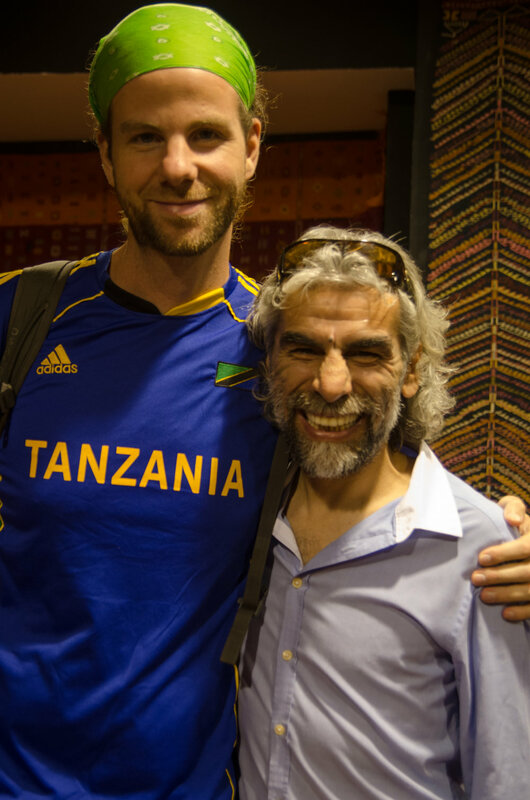 Our photos with them were interrupted by another Turkish dude who I think got in the same picture with the kid from Senegal. I asked the group of girls if I could take their picture, they readily obliged. And then, another group of girls took over. A little bit younger and a more adorable because of it. They giggled. They asked us the same questions in the same broken English. They took turns squeezing in between me and Andrew to take pictures on their mobile phones. They readily posed for a picture for me (unfortunately my polaroid was back in the bus locker for the afternoon) and then they pointed to their cheeks to say goodbye. Andrew didn’t get it immediately, but I did and immediately bent down to touch cheek to cheek. With all three of them. Then one pointed to her cheek again and then to her lips. I gave her a kiss on the cheek and her friends circled back to me for one as well, and did the same to Andrew, who followed suit. They made sad faces, clearly not wanting us to go, while we tried to get away as smoothly as possible, not understanding (AT. ALL.) what the fuss was about. 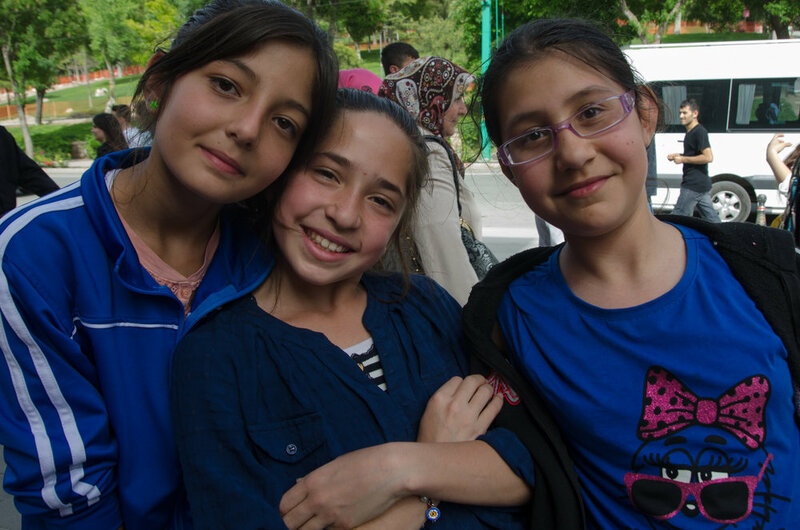 Regardless, it was the sweetest interaction we’ve had in Turkey so far and as always, any interaction with local children (who aren’t trying to sell us anything) always makes my day. 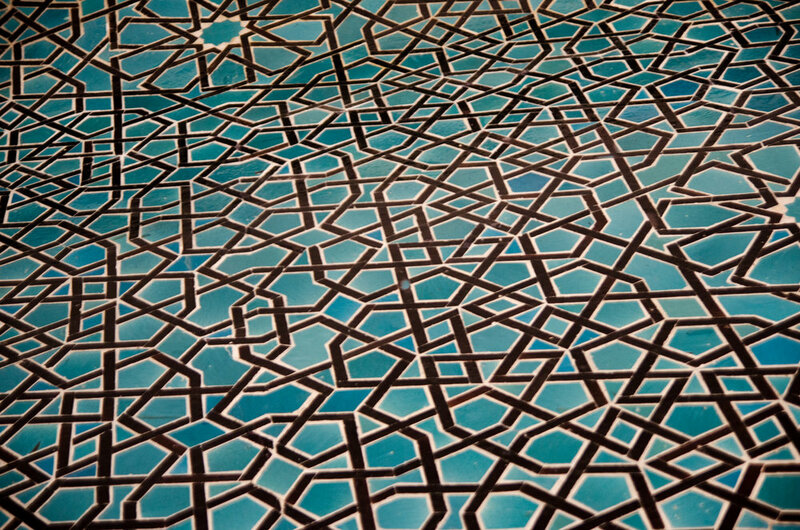 We headed to the Karatay Müzesi after our five minutes of fame in Turkey and I was again delighted with the tile work. 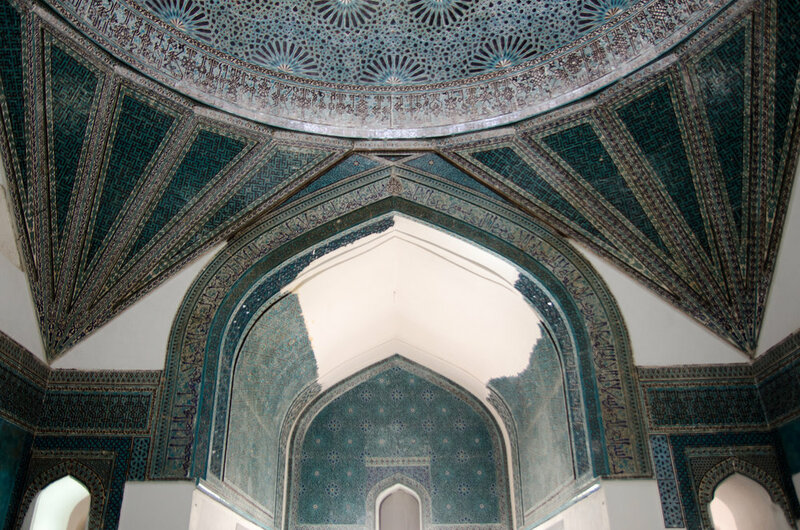 Say what you will about the Islamic faith, but damn they know a thing or two about interior design. Especially when it comes to a madrassa. Andrew and I agreed that we’d like to have a living room designed with the same aesthetic. You know, in our studio apartment in New York, we’ll just add a few domes, tile it and boom: our own private madrassa/living room. Now, about these dervishes. Perhaps you’ve heard about them. The dudes who whirl. I thought it was a performance, before setting foot in Turkey. Even as you wait in line for the Ayasofia, pamphlets are handed out with ‘showtimes’ for dervish ‘performances.’ This is not really the case at all. 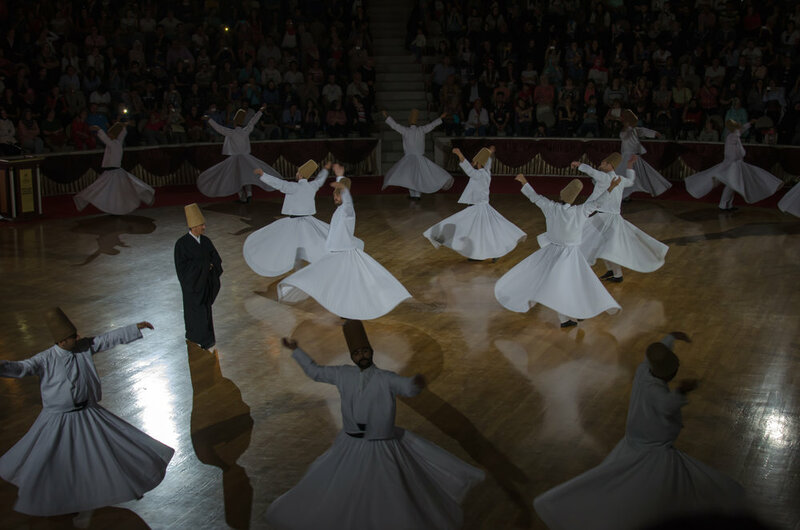 A dervish is someone who follows a more specific Muslim path known for poverty. They are the sadhus or monks of the Muslim faith- in Turkey. The whirling began when the founder heard music in a market and felt so spiritually connected that he began to whirl. The birthplace is here, in Konya. 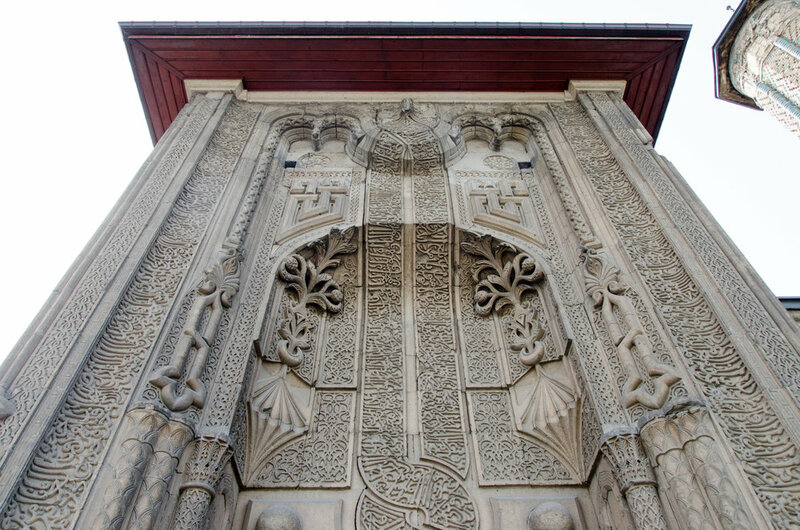 What used to be the dervish lodge and mosque is now the Mevlâna museum and mausoleum of Jalal ad-Din Muhammad Rumi, a Sufi mystic also known as Mevlâna or Rumi (aka the founder). It was CRAZY crowded full of mostly Turkish pilgrims and a few foreign tourists like us checking it out before the free ceremony at night. Not only was it crowded, but it was like the pilgrims there (mostly big groups of older women and their children) had never been outside of their hometown before. There was pushing. Bumping into. Complete disregard for anyone trying to read an information plaque or peek inside a small room set up as a museum display. You know in basketball when you take a charge, it was kinda like that. Only my opponents were my height, twice my size, and were leading with their chest, not their shoulders. Our ‘timeout’ wasn’t any better. We watched a Chinese tourist photograph two women sitting down for nearly ten minutes as they giggled and avoided eye-contact with the man behind the camera. He didn’t even acknowledge them after he photographed them. Instead, he stood up and reviewed his images on his LCD screen (without showing the girls) and walked on to photograph other women sitting nearby. Photographers- or anyone with a camera for that matter, who have complete disregard for their subject get under my skin. It reflects poorly on anyone with a camera. Acknowledge who you are photographing, especially if it’s so close. Thank them, if you can’t in their language, at least with your eyes. And show them what you captured! We had to leave because I couldn’t watch him anymore. A few hours later, we were standing outside the auditorium being shoved into a single door to the Dervish ceremony. One door for an auditorium the size of a small baseball stadium. No ropes. No line. Absolute zero order. There was open seating inside, and as we arrived a half hour early, we were able to find a seat with relative ease. I wanted to see this ceremony specifically because I thought it would be less touristy and more true to its origins. The auditorium filled up rather quickly and there weren’t enough seats for all of the audience members. And despite the announcement mostly being in Turkish, the part about “no flash photography” was clearly emphasized in English. Unfortunately, this did not stop half of the audience from whipping out their iphones and ipads to take pictures and videos with their camera light on the entire time. After the ceremony had started, audience members continued to stand up waving their friends and family over to where they had seats saved for them. Everyone continued talking. Five minutes into the ceremony, an entire row of Turkish men got up in front of us and left. Then another group of Turkish men slid into their seats- for maybe ten minutes, before they too, decided the ceremony simply wasn’t for them and left. At one point one man a few rows up stood up to talk to his seat-mate, standing, during the whirling. He was facing the audience having a conversation with his friend while everyone struggled to see around him. It was a Korean wedding. In other words (if you’ve never been to a Korean wedding) it was a series of old women walking down the aisle, shoving the bride aside, so she could sit down where she wanted. At one point, a plastic chair fell down the steps, essentially echoing throughout the hall over the music and the quiet, mesmerizing whirling. It. was. bananas. And it was not because of rude foreigners because we were surrounded by groups of Turkish women and Turkish men. Rarely were they mixed, sitting together. Aside from the (beyond obnoxious) audience faux pas, the ceremony was beautiful. The music, especially the singing. The whirling. It was all beautiful. Unfortunately, we think the ceremony ended earlier than usual and we think it was largely due to the audience and their lack of… care. We both agreed that we were glad to have come, we had a surprisingly interesting afternoon in Konya and it was still interesting to see a dervish ceremony that was not disguised as a performance. However, now I’m somewhat keen on seeing one of the touristy performances out of curiosity if the audience would be more respectful or not! 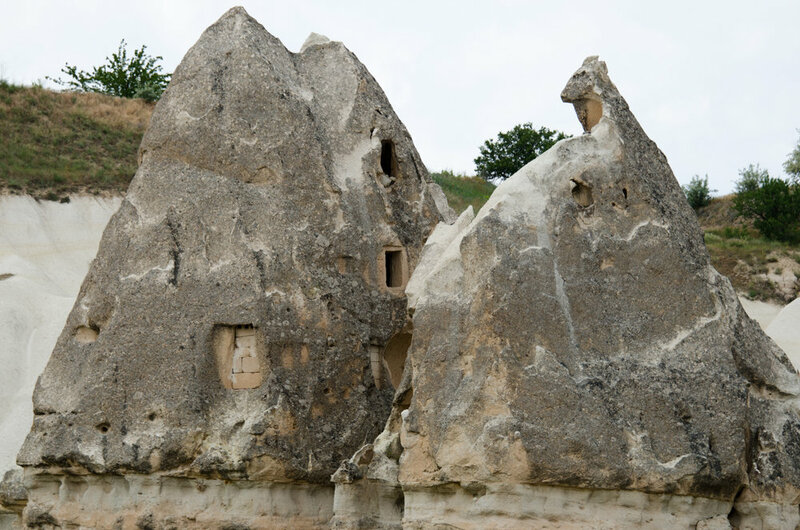 There are a lot of independent walking trails around Goreme (and I’m sure in other parts of Cappadocia as well) to see as many fairy chimneys as you want. We set off early in the afternoon to be one with nature. Not many others seemed to be taking the trails less traveled and for the majority of the afternoon it was just me, Andrew, and the fairy chimneys. I had left my tripod behind, but piled up our jackets on top of my backpack to set up the self timer for some shots of us sitting on the ridge overlooking the penises, I mean, fairy chimneys. We sat for awhile enjoying the weather and the solitude. I swapped out lenses to get some close ups, can you imagine living at the top of one of these things? Aside from the towering chimneys, I was also quite taken with the pretty wild flowers. 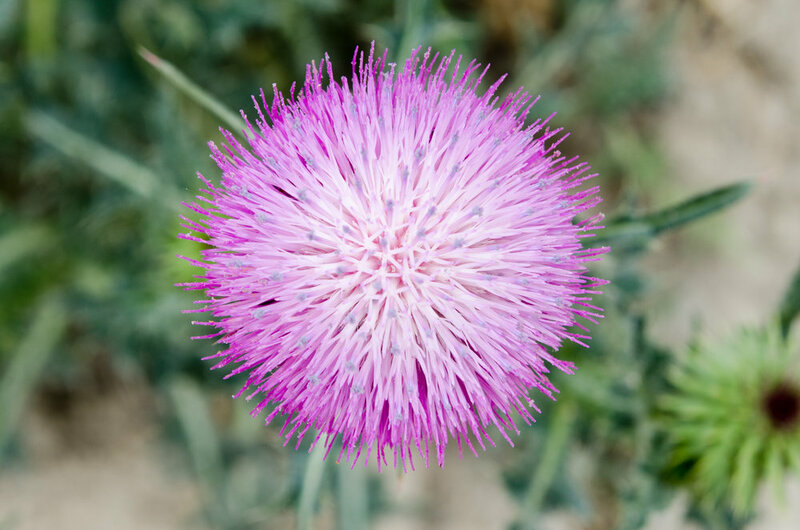 Andrew scolded me for taking pictures of weeds, but I thought they were pretty and deserved a little attention. 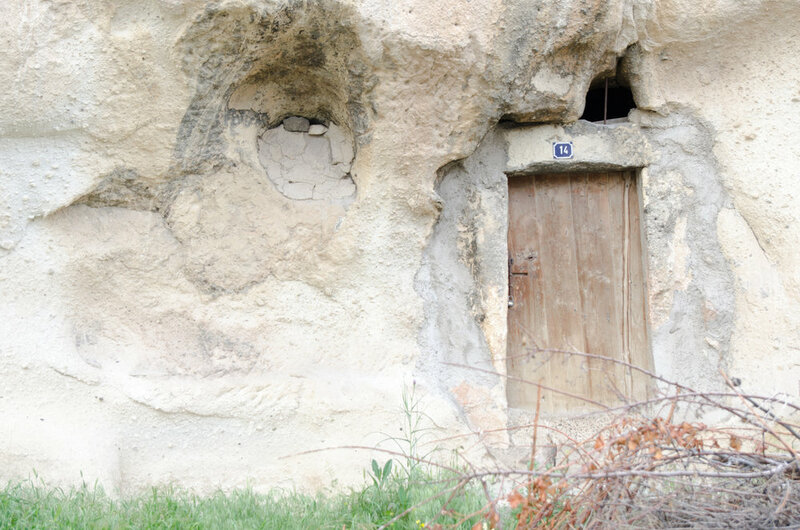 The Göreme Open Air Museum is only a fifteen minute walk outside of the heart of Göreme, where we were staying. 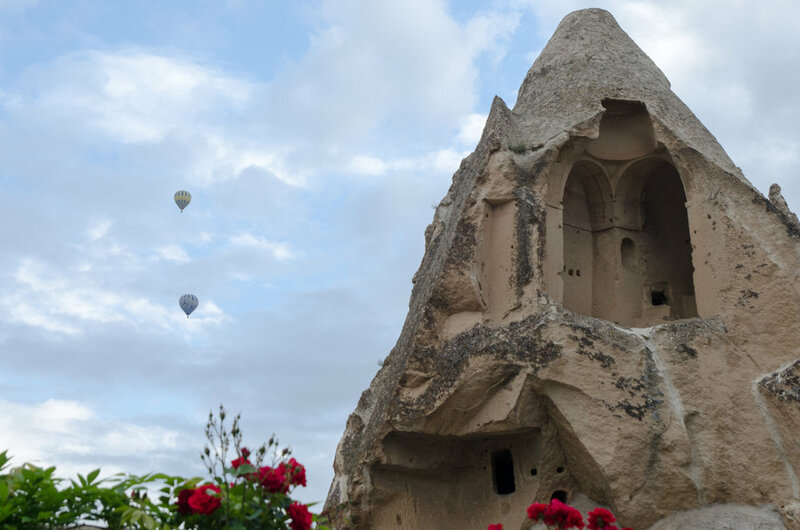 Göreme, is a small town in an area of Turkey known as Cappadocia. 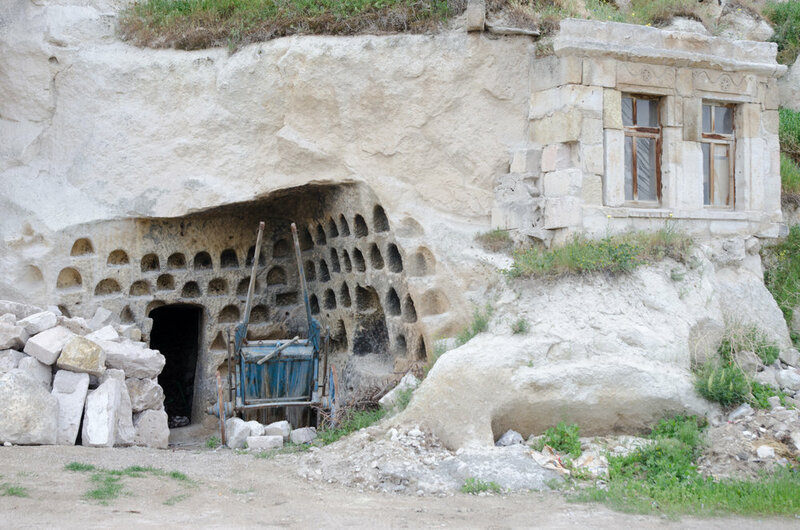 Göreme is located among the “fairy chimneys” as well as the Open Air Museum. 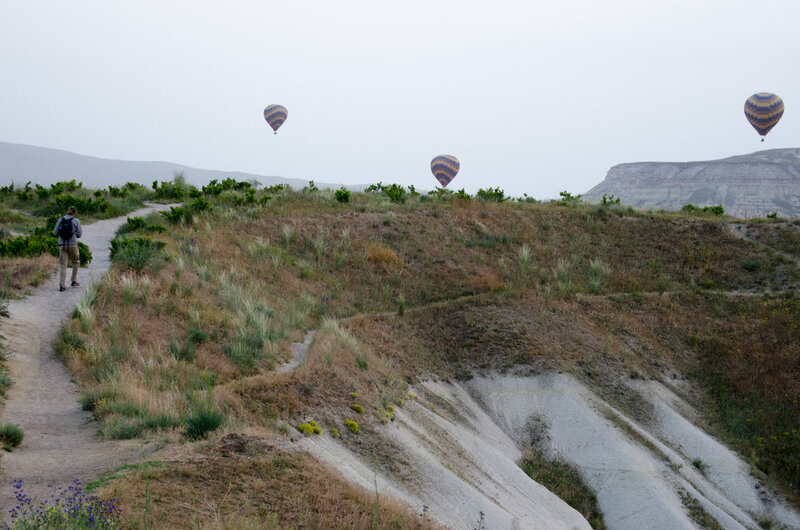 Göreme Valley was designated as the center of tourism in Cappadocia and while the town doesn’t necessarily reflect that (in my opinion) the vast quantities of tour buses driving through do. The town continued to be on the sleepy side the entire three days we were there, but then as soon as we got to the Open Air Museum, we were faced with a parking lot full of tour buses and large groups lining up to see the ancient rock churches and houses. “So… what was this place?” I quizzed Andrew as we walked past several formations before we even set foot in the Open Air Museum. He shrugged, and we hoped there would be more information within the museum walls. Somehow. Even though it was ‘open air.’ Before we reached the designated museum, we noticed a line outside of one of the formations. The line was for the Buckle (also known as the Tokali) Church. There was a lot of information about what was painted where within the church, but not a lot of information on who worshipped there. Christians, obviously, but that was pretty much all of the information that was shared on the plaques outside of the entrance. Also, photos were prohibited. I’m not entirely sure why, but because I’m rebellious, I snapped a few anyway. (I didn’t use my flash, which is what I think they were really trying to prohibit) The frescoes were simply too beautiful not to share. 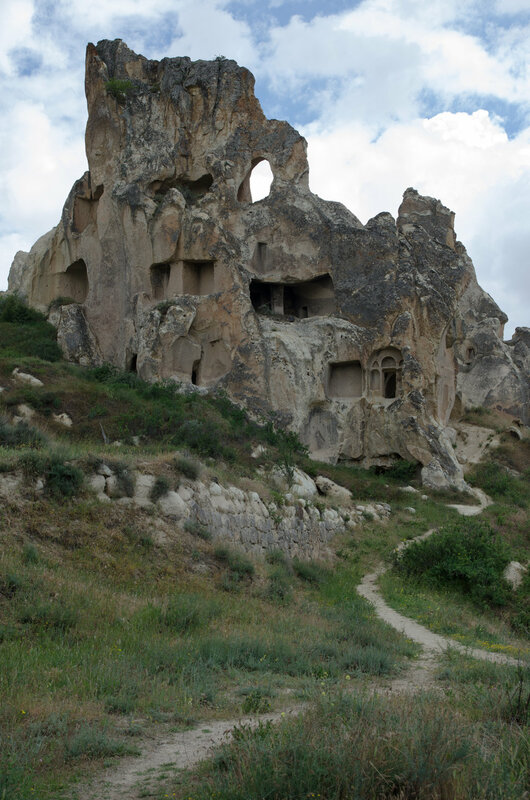 Here’s what I know: Göreme was settled when Christianity was the religion of choice in the region. 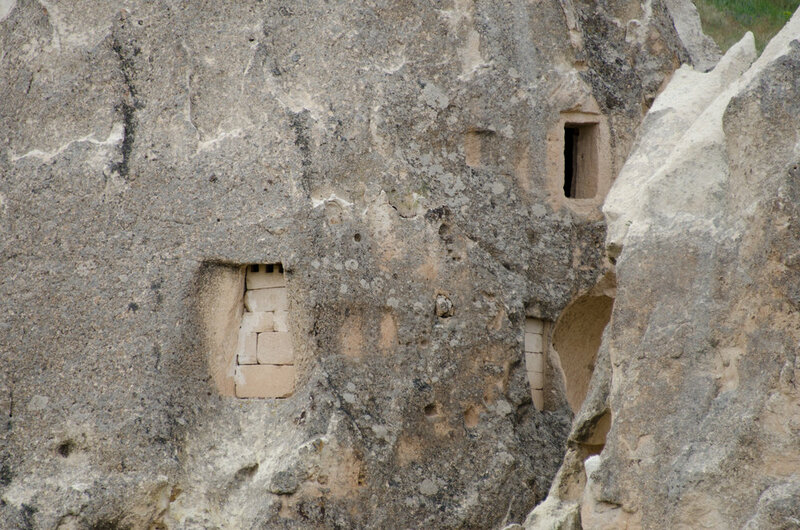 These churches were cut out of the rock formations sometime between the 10th and 12th centuries. Most of them feature some frescoes ranging from crude cave-like painting to elaborate multi-colored depictions of biblical stories. Again, not a lot of photography was allowed within the churches. “I’m done.” Andrew declared, walking out of my frame. He grabbed my camera (his has become a bit of a waste of space with a broken battery charger) and we traded it back and forth for the rest of the afternoon. 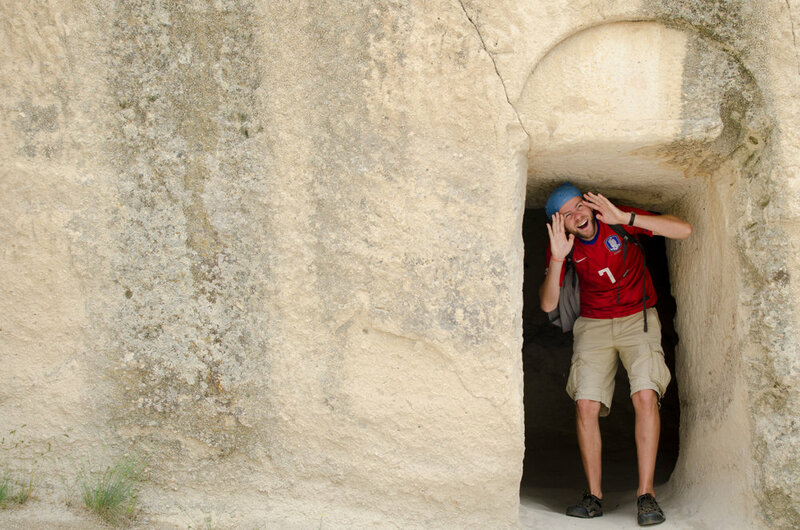 After the Open Air Museum, and instead of walking along the road back to Göreme, we decided to go exploring. There were a few paths, so we thought we’d see where they led. This part was actually a little scary. The path kind stopped right at this rock ridge. It was a fairly narrow ridge as well, with steep slopes, one side falling off down into a canyon with more formations on the other side. Fortunately, it wasn’t terribly long and then we could slide down on all fours to a wider berth to walk back down to the road. Before we made our way back down though, I set my camera in a nook and hit the timer. We weren’t even sure if I was in the shot, let alone in focus, but they turned out well! Our view back down to the road was pretty spectacular, and we were all alone. I liked walking around outside of the Open Air Museum more than inside with all of the tour groups traipsing around. It was quiet and amusing that we were the only ones exploring on the other side of the road as we could see the many, many tour buses driving past. Sometimes I wish we were in a group, for the simplicity of it all. This was not one of those times. 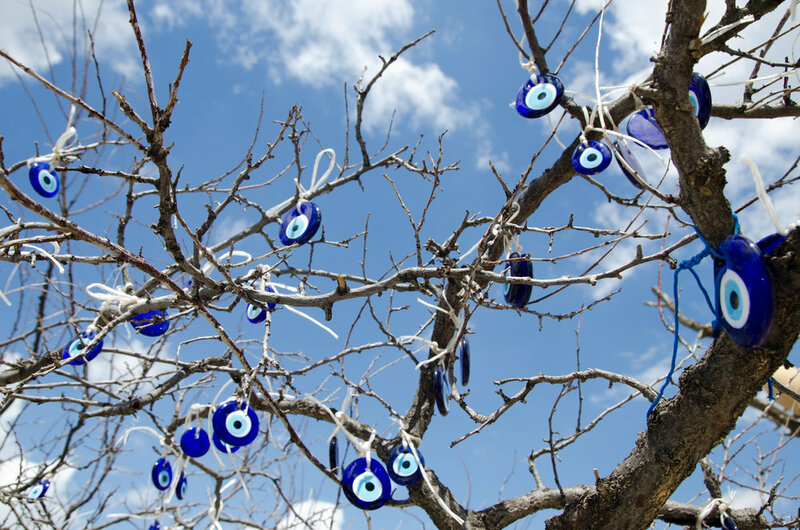 This amulet that is so popular in Turkey thought to protect you from the evil eye is called a “nazar.” You know, for your next trivia night, I got you covered. 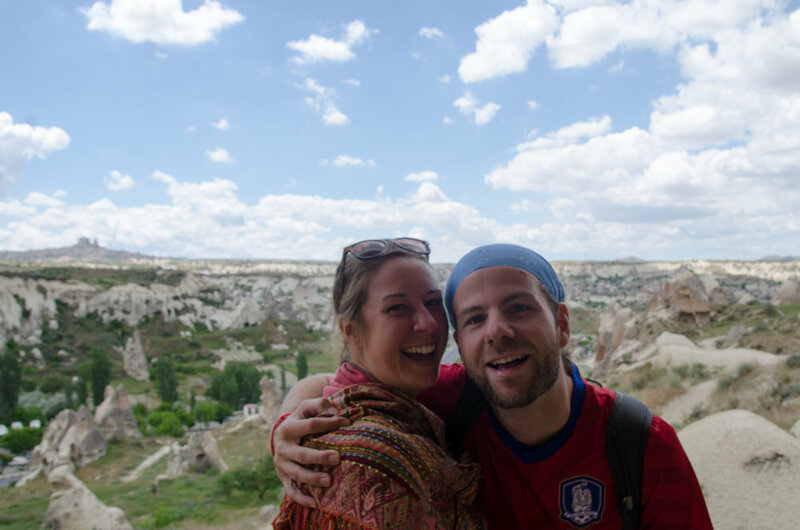 Although we have a completely new perspective on what constitutes a bad bus ride, neither of us slept on the overnight bus from Antalya to a sleepy Goreme. 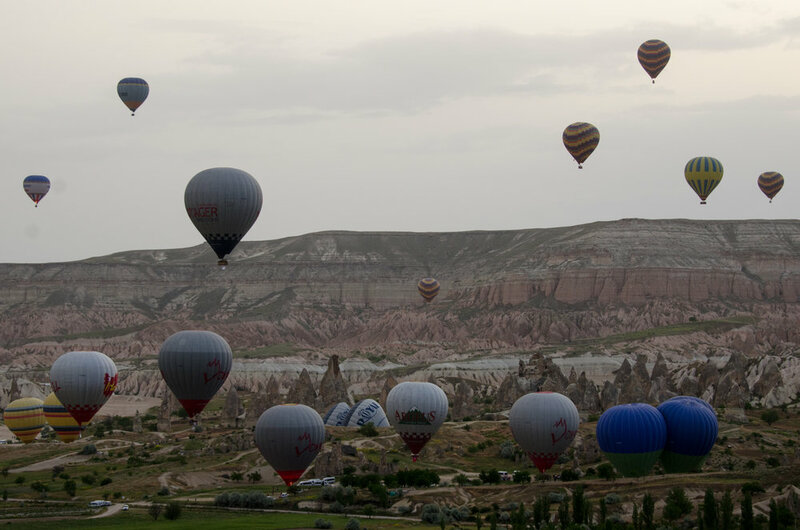 We arrived exhausted, but completely surprised and delighted to see a sky full of hot air balloons rising up over the small town. 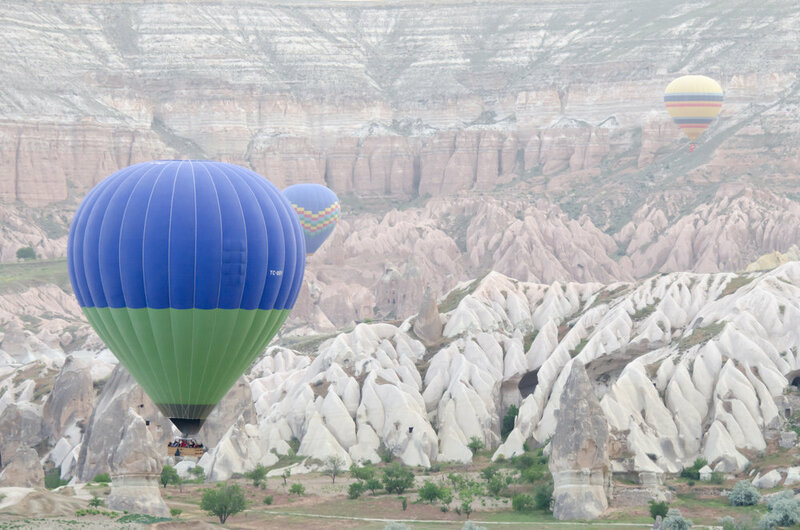 It felt a bit like a fairy tale driving by big rock formations with balloons floating above us. 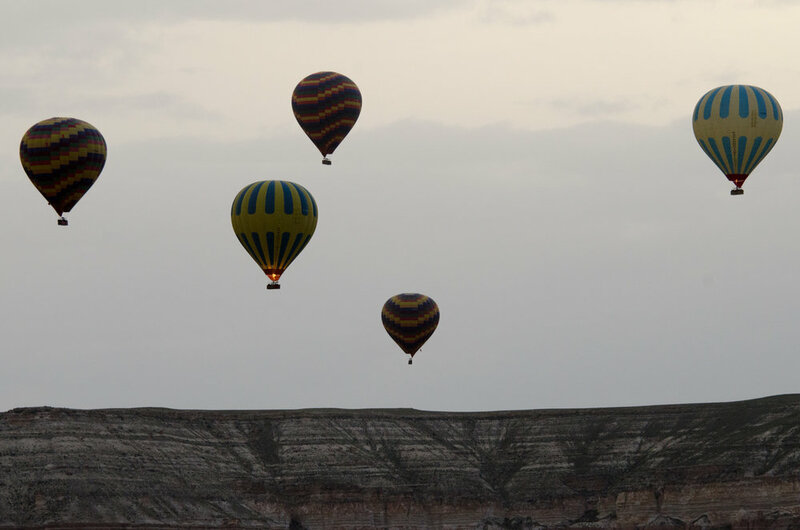 Unfortunately, despite the plethora of balloons filling the sky, no one else in the town seemed to be awake. We waited in a guesthouse lobby for nearly two hours for someone to wake up to check us in! I even snuck out to take some pictures (and distract myself from being frustrated we couldn’t check in and go to bed). I was surprised at how simple some of the houses appeared to be. I was also surprised that no one seemed to be alive or at least awake. The town was dead aside from a few vans dropping off tourists who had finished their balloon ride and could crawl back into bed for a few hours before breakfast. No one ever woke up or arrived at the guesthouse. We gave up and checked into another guesthouse down the road. By the time we were able to check into that room, our eyes were bloodshot and we couldn’t think straight. I think the cleaning woman took pity on us and cleaned our room as fast as she could. She smiled gently as we thanked her minutes before we collapsed in bed. We slept for awhile, until we ate a late lunch/early dinner. And then, went back to bed, hoping to wake up in the morning rested and ready to go. 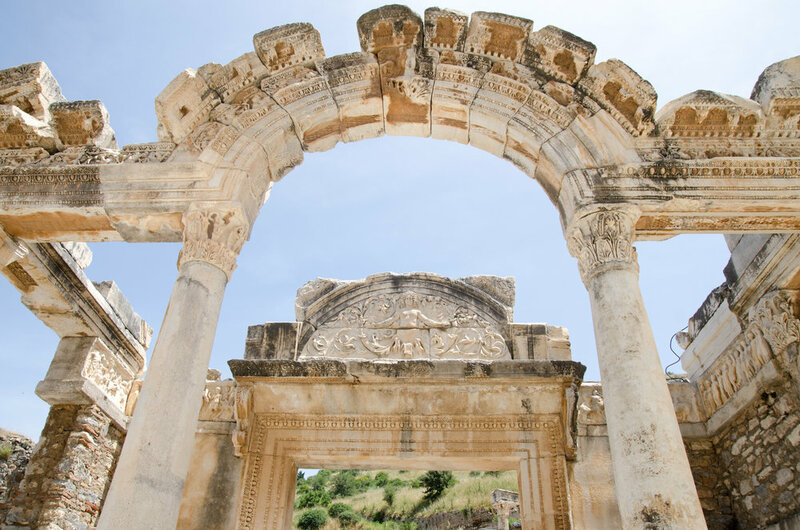 Hadrian’s Gate is one of the few ruins in Antalya to see. 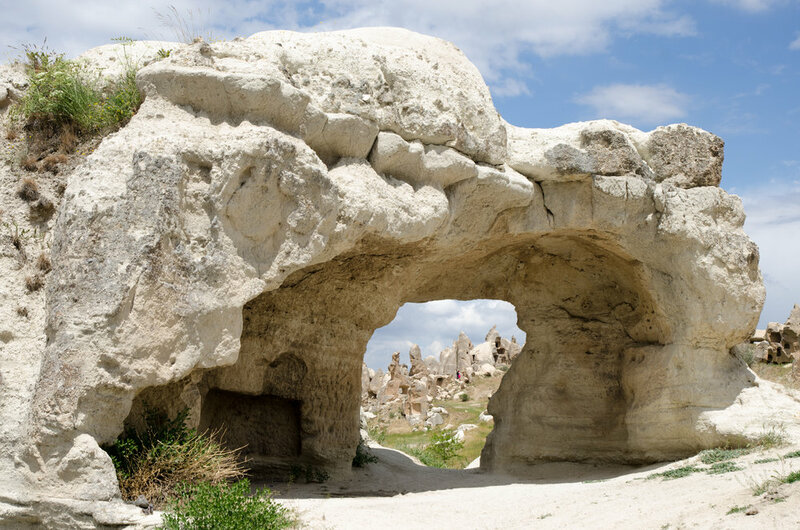 We happened to stumble upon it looking for bus companies to book our tickets to Goreme. I’m glad we did, because even though it’s not as spectacular as other ruins, it’s still pretty incredible to think that this was built in the year 130. Yea, you read that right. 130. It was built for the Roman Emperor Hadrian who visited that year. Apparently city walls were built around the gate and it wasn’t used for awhile, which is why perhaps it’s in such good condition these days. After being in Africa, where the history is mostly oral, it’s really incredible to be in a land overflowing with visual history. 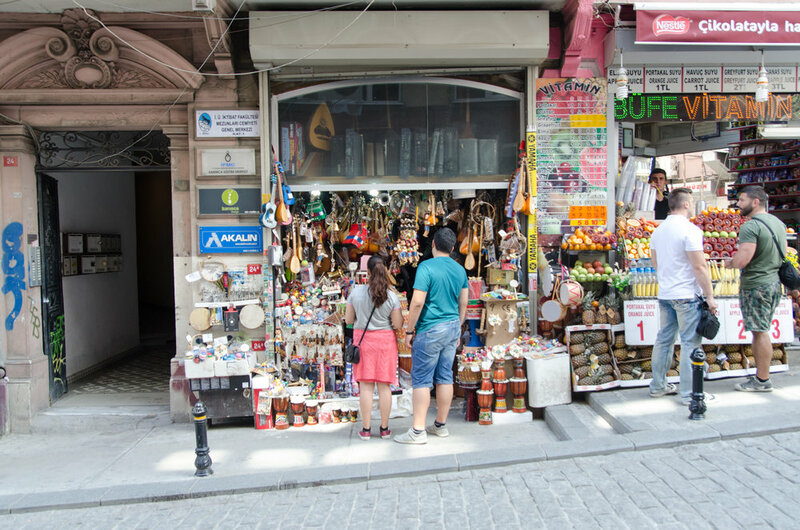 Afterwards, we swung by the bazaar, and much like the Grand Bazaar in Istanbul, I was a little dismayed at the majority of the market being more knock-off bags, rhinestone studded Euro jeans, knock-off sunglasses, knock-off shoes, etc. etc. etc. We didn’t stay long. Early in the evening, after figuring out where exactly the bus company was, we were able to purchase tickets and get a “service” ride to the station for our overnight bus to Goreme. We were going to go to the beach. Maybe go out on the Mediterranean… Get dropped off on a secluded beach and picked up later. I’m told it’s one of the things to do while you’re in Antalya. And then it rained. Not just rained. It. poured. Trust me, this post is a fairly accurate recap of our day. Antalya is Turkey’s biggest international sea resort, although really, you wouldn’t guess it from walking around its quiet and charming old quarter. After breakfast, Andrew and I walked around, occasionally stopping to check out bags (mostly of the knock-off variety) and take pictures of the stunning Mediterranean. At the port, as we waited to get an ice-cream, a father and son approached. The father, more courageous than his son, in a few words asked if we would help with some homework. This is not new to me. It’s a fairly popular assignment in Korea, and I had already been interviewed in Istanbul. The poor guy nervously asked me questions while his brother recorded the interview and his mother supervised the whole thing. They were finished by the time Andrew came back from the snack stand with a bottle of water. This time, turned out to be entirely different. We were led to a cafe, we were ordered more ice-cream, and then a few days later, this is just one of the images that showed up in my inbox. When we sat down, Andrew was delegated to write down our answers. Dad filmed the entire interview. Sometimes getting up for different angles. He told us over ice cream that he was a photographer for the police department. When the son seemed satisfied with our interview, the waiter was summoned. We had just finished some ice cream, and didn’t really need anything else. We tried to politely decline. They were not having it, and somehow, it was decided that we probably needed more ice cream. Big. bowls of ice cream. Andrew and I played along and looked over his interview, correcting mistakes. His father was beyond excited when we told him we were both English teachers. We tried to chat with the son, but either he was nervous or really really low level. Once our ice cream was finished, we thanked them both and turned to leave. I thought the father was going to email me the video, but instead I got three emails full of fabulous pictures from him instead. We walked around as long as our sugar highs would allow and then crashed. hard. It was to be expected after what turned into eating a ridiculous amount of ice-cream for lunch. Our guesthouse was located right in the center of the old town though, so it was easy and convenient to duck inside for a nap before dinner or more walking around town. A lazy morning after a late night out in Istanbul followed by a quick flight to Antalya was our day. Arriving in a quiet Antalya was a breath of fresh air after spending a week and a half in busy Istanbul. The cobblestone streets were empty. Only the occasional call to prayer interrupted the quiet old quarter. It was lovely. It was also starting to rain by the time we checked into our room. We stayed in, hoping for better weather in the morning. We had planned on joining the hop on hop off bus tour (City Windows Sightseeing) around Istanbul, but after waiting for ten minutes to purchase a ticket (while other customers complained, asked for refunds, etc.) and then getting a shoddy exchange rate, we figured it wasn’t worth it. Instead, Andrew and I wound up hanging out in a cafe off Taksim Square trying to process claims with World Nomads for our missing luggage and attempt to start filing claims related to our accident in Tanzania. This has not been an easy (nor enjoyable) process. But the entire situation could have been much worse had we not been staying with our friends, Juliet and Daniel. They let us take over their computer when our portable modem was lost in our luggage. They let us use their phone number to give to the luggage and airline companies who liked to call them in the middle of teaching. They cooked us dinner, let us make dinner, and kept us company even though we were wearing the same dirty clothes for multiple days in a row. Thanks, Juliet and Daniel, again. You are champions. Throughout past trips, I’ve shied away from travel insurance. This is probably not the smartest thing to do, but I did so because in my experience, pharmacies, and from what I’ve heard- hospital visits (I’m sure everyone has a different story) in Asia have all been very cheap and easier to pay out of pocket than to worry about receipts and dealing with insurance after something goes wrong. I refused to get travel insurance at the start of this trip. Andrew complained. He threatened to call my mom. (I wondered which side she would have picked) He even suggested paying for it. I refused, rolled my eyes, and changed the subject. This tactic worked rather well until we touched down in Morocco. Once we were in Africa, distracting him from the idea of me not having insurance didn’t work as well. To make him happy, I bought an entire six month plan through World Nomads. Coverage began the day before we flew down to Uganda. He was happy. I was happy (that he was happy). Fast forward to arriving in Istanbul without our luggage for several days. We lost at least three full days to waiting around for our luggage when Havas Ground Company (affiliated with Etihad Air) told us our bags would be delivered. I wondered if our insurance covered anything. They said they would! I just needed to provide luggage tags and receipts. No big deal. I didn’t have the receipts for the clothes I bought- but I had a credit card statement, and according to their website, that worked. Done. I wondered if they would cover my iphone and lens that were both damaged in Africa. I filed a claim. They needed proof we were on the bus that crashed in Tanzania. They asked for our tickets. It was a bus in the middle of Africa. There were no tickets on these buses. You haggled over the price, you got on the bus, you hoped you made it to your destination safely. Unfortunately, we didn’t exactly make it to our destination safely, and we didn’t have good enough internet at the time to deal with the start of an insurance claim. If they accept my pictures (of the bus off the road) and my passport stamps (from the border crossing we were on our way to) and if the guesthouse responds to my emailed request for a statement that we indeed stayed there, then I just have to figure out a way to get proof that I originally purchased my iphone in Korea two years ago. Because, that should be easy enough, you know, while I’m in the middle of Turkey. 1. Before you go on your trip, scan any and all receipts or proof of purchase for items of value you will be traveling with. 2. If you do not get a ticket, and your bus crashes, even if you’re ok at the time: ask your guesthouse to call the bus company for a statement or proof. Get a document from your guesthouse with dates and your name on it that you stayed there. Notify your insurer to simply say “we’ve been in an accident, we’re ok right now, but… is there anything we should do” Because if I HAD done that, then I would have been at least able to get a receipt for where we stayed and it would have been easier to get proof from the bus company that there was an accident. I still cannot say that I’m an advocate for travel insurance. 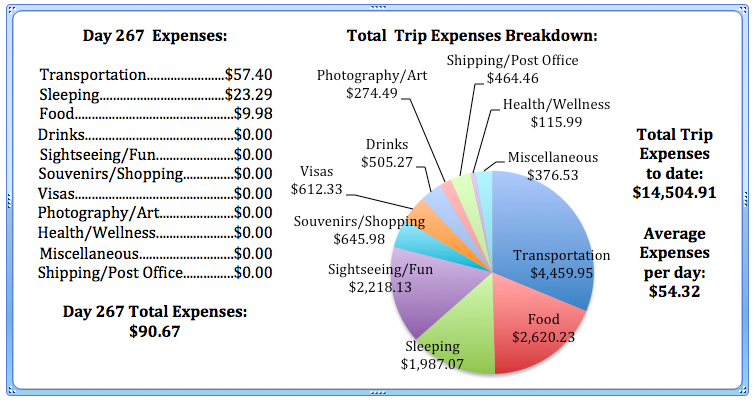 So far, even having the appropriate documents (according to their website) World Nomads is giving me the run around over a claim for a grand total of $51.00 after not having my bags for three days in Istanbul. I purchased the insurance not to get reimbursed for a few days of discomfort in dirty clothes, but for the possibility of my bus running off of the road in Africa. I needed and maybe will continue to need insurance traveling through places that don’t accept credit cards and don’t provide receipts when you pay in cash. What is the point when you get insurance and they won’t cover your claim because your pictures of your bus off the road in the middle of Tanzania and your passport stamp at the little land border crossing a few days later aren’t enough proof? If I could go back, I probably still would have purchased the travel insurance. For Andrew. I would purchase it for me, for him. But I would have called World Nomads immediately. I would have asked for receipts (even though in some places, they don’t know what a receipt is and you have no way to communicate that to them) when they weren’t given. I would have taken more pictures. I would have figured out how to email World Nomads with all of the necessary documents before we left Tanzania. I would have. Wouldn’t you? I mean, would you think to do all of this after your bus goes flying off the side of the road at 130 kilometers per hour in the middle of nowhere on the east coast of Africa? “Are you going to stick it to them?” Andrew asked, laughing at me, as I stood outside of the museum after our visit ready to film one whole minute of the outside of the building. “Yes.” I pouted, annoyed that the museum wouldn’t let me take any pictures (or video) inside. I snuck a few Instagram shots (which of course I got yelled at for every time) but that was IT. I even had to check my backpack. So, instead of being able to show you visually some of the really rad installations, including one of my most favorite contemporary artists, Olafur Eliasson (you can see more of his work here), I give you a boring one minute of Istanbul Modern. I always wonder if it’s the museum or the artists being showcased who insist no photography is allowed. If I ever end up in a contemporary art museum, I think I’d pay people to take pictures of my work, I’d be so excited! I also get super frustrated when prints of the art I want aren’t available in the museum shops. I’m not going to print it out from my iphone or anything, I just want to remember (and share) what I saw! It’s one of my biggest pet peeves of the art world. 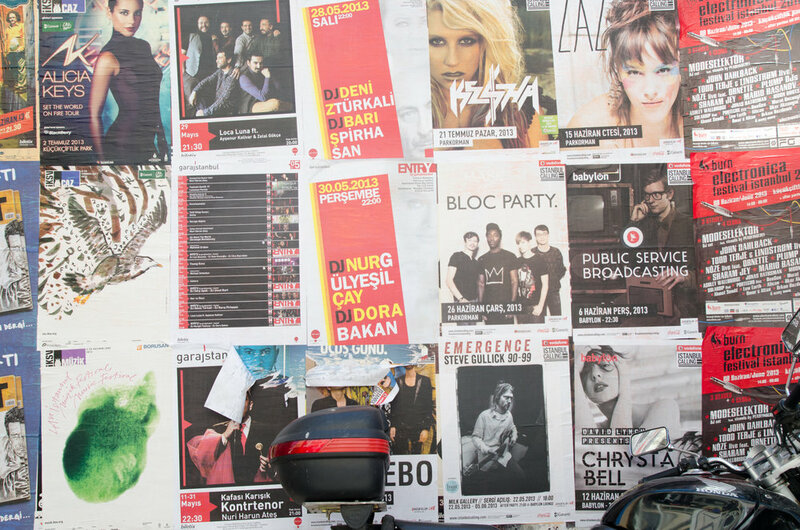 Moving on: in case you’re interested in seeing what Istanbul Modern has to say about two of the exhibitions that we saw, you can read about Past and Future here, and about Fantastic Machinery here. (There were two other exhibitions in the museum, but there doesn’t appear to be any information on them on Istanbul Modern’s site.) Fantastic Machinery was probably my favorite exhibition. It was really well curated AND there were some Robert Frank images in the collection! Yep, you read that right. Day 247 of our trip around the world revolved around going to see Iron Man 2 in the theater. Andrew is a huge cinephile. We used to go see a movie in the theater at least once every two weeks, sometimes once a week if we had time in South Korea. He loves it. I love the popcorn. (It’s a win win!) He’s been itching to see a movie in the theater for awhile. (The last time we saw a movie in the theater was in India.) We were supposed to in South Africa, but it never worked out. Juliet had the afternoon off, so off we went to spend a day at the movies in Turkey. Today’s video is of the walk back from the bus stop along the Bosphorus, past the fish market and along the street leading up to Juliet and Daniel’s house. And below, is an image of the crazy amount of jellyfish in the Bosphorus.